A typical eCommerce marketplace has witnessed its fair share of transitions and evolutions. With all these alterations underway – this domain has gone on to become one of the most lucrative sectors of the 21st Century. 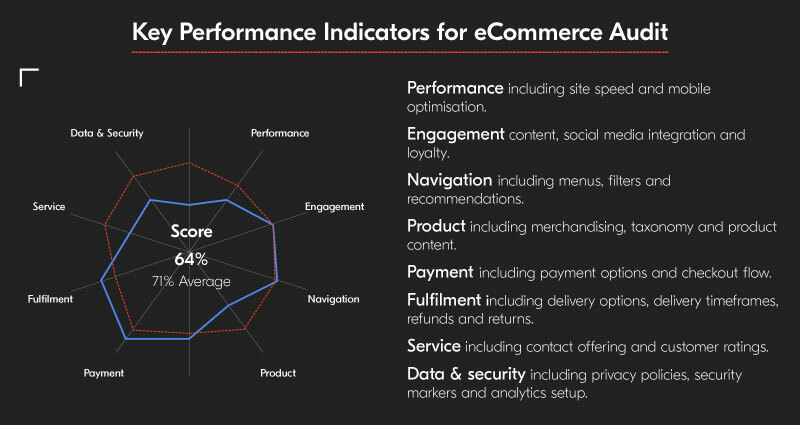 So, what’s next on the plate for a traditional eCommerce business? The answer is relatively simple and straight-forward – BLOCKCHAIN. Blockchain has been enjoying a good run in the financial industry for quite some time now. According to a recent Statista Report, the global blockchain market is expected to see a surge of more than 400% by 2021. As blockchain is inching closer to the real sectors of the economy – An increasing number of people have now started talking about other possible use-cases of blockchain apart from finance, especially in the most lucrative domain of them all – eCommerce. The eCommerce industry has disrupted the way we shop & live, and blockchain is on its path to disrupt eCommerce. The implementation of blockchain technology in eCommerce marketplace will ignite a significant shift by establishing a decentralized economy. Now, if you want to learn more about blockchain, then you must visit this link. In this post, we are going to be extensively covering how blockchain is on its way transforming the ecommerce marketplace. Stay tuned, as this post is definitely going to leave you surprised. Blockchain witnessed its first implementation in currencies powered by its technology (like bitcoin, etherum, and ripple). Today, cryptocurrencies are being utilized as an alternative to traditional currencies. This shift is due to the relative ease of implementation and the fact that they are decentralized. Bitcoin and other cryptocurrencies provide numerous advantages over traditional currencies which benefits both customers and merchants. Blockchain isn’t regulated by any central authority which basically implies that the buyer and seller only control blockchain operations. Thus, no third party can look over or manipulate your transactions. Blockchain currencies can’t be inflated or devalued by any bank or government, as is the case with other currencies. For instance, if the economies of a country were to collapse today, their currencies would terribly suffer which is not the case with bitcoin because geopolitics do not influence its operation. Cryptocurrencies based on blockchain technology don’t reveal the identities of the transacting parties. Still, these transactions are very transparent as centralized ledger stores the details and give visibility to transactions. There is no governing body which controls how a person utilizes his/her bitcoin. Regular payment methods are often imposed with several limits based on the amount and even geographical location. However, this isn’t the case with currencies like bitcoin – Blockchain-based currencies gives users absolute freedom to perform transactions without any cap on the spending limit. Blockchain-based currencies are incredibly comfortable to use. Unlike traditional currencies, one doesn’t need to visit any regulatory authority to create an account. All these can be easily accomplished at the comfort of your home. Additionally, they do not levy any charges to open an account; instead, a virtual currency wallet is absolutely free. Traditional transfers often take long, especially sending money across continents may take up to several days to accomplish. Bitcoin transfers, on the contrary, only takes up a few minutes! Most importantly, they aren’t closed at any point in time, and a transaction could be carried out at almost any point of time, in an instant. Blockchain-based currencies are extremely secure to transact with. Because of peer-to-peer technology, it is tough to hack into the process and conduct a fraud. Thus making it one of the safest modes of transaction. With recent developments, it is very much likely that eCommerce marketplaces would soon allow consumers to pay with Bitcoin rather than Stripe or PayPal. In addition to being decentralized, secure and relatively easy to implement — sending and receiving money will become as convenient as scanning a QR code. The relative ease of making payments is likely to be the first implementation of blockchain in the eCommerce marketplace. Supply chain management is perhaps, one of the most pressing concerns every eCommerce business is marred with. Since the supply chain is a critical element of any eCommerce business – blockchain implementation in this sector will likely solve many problems. Blockchain can be extensively leveraged to solve supply chain issues like recordkeeping, tracking of products as a less corruptible and better alternative to the centralized database. In a blockchain-based supply chain, record keeping and provenance tracking become easy, as the product information can be accessed with the help of RFID tags and embedded sensors. The timeline of a product right from its inception to where it is at present can be traced through blockchain. Besides this, the type of accurate provenance tracking can also be leveraged to detect anomalies in any segment of the supply chain. When blockchain is applied to amp-up the administrative processes in the supply chain, the extra costs incurred by the system is automatically reduced while still guaranteeing the security of transactions. The elimination of intermediaries also eradicates the risks of frauds, product duplicacy while saving money at the same time. Customers and suppliers can further process payments within the supply chain by utilizing cryptocurrencies rather than customers and suppliers or relying on EDI. Blockchain can be extensively utilized in the backend of the supply chain as well. For instance, the management of inventory becomes a whole lot easier by introducing blockchain in the process. Blockchain implementations in inventory management enable retailers to avoid unnecessary expenditure on hiring new staff time and again. With the recent backlash that big retailers have been facing in the wake of charges of lack of transparency – this is one of the more serious concerns faced by existing eCommerce platforms. For instance, Amazon was in the news for cutting-off and even disabling a merchant’s page without any explanation. Thus, by applying blockchain technology in the ecommerce marketplace would establish a decentralized environment where any wrongdoings on the part of the business or merchant can be efficiently monitored. A transparent eCommerce marketplace also facilitate in conducting transactions in a frictionless and efficient manner. Moreover, with the declaration of recent blockchain projects by retail giants like Walmart and Unilever – it is evident that they are eyeing at gaining a foothold in blockchain-based offerings. Blockchain today, can be easily deemed as one of the most secure platforms out there. The Distributed Ledger Technology or DLT which blockchain boasts, offer excellent security for online database platforms that makes it ideal for implementation in eCommerce. Also, there has been almost negligible reporting of security breaches in blockchain-powered networks. Another significant upside blockchain offers for eCommerce businesses is that blockchain-based currencies don’t exhibit personally identifiable information. Currencies like Bitcoin operate like cash in the sense that they don’t require a consumer to expose sensitive data. In fact, the customer himself authorizes a transfer from his/her own personal “wallet” to that of the recipient. The only distinguishing piece of data tied to each user’s wallet is a randomly-generated unique identifier. Since cyber attacks and data theft has increased tenfold, there is an inevitable risk of losing customers data. Therefore, adopting blockchain is an absolute key to solving these challenges. Reviews – good or bad—can determine the order in which a business appears on an ecommerce marketplace or in a search query result. 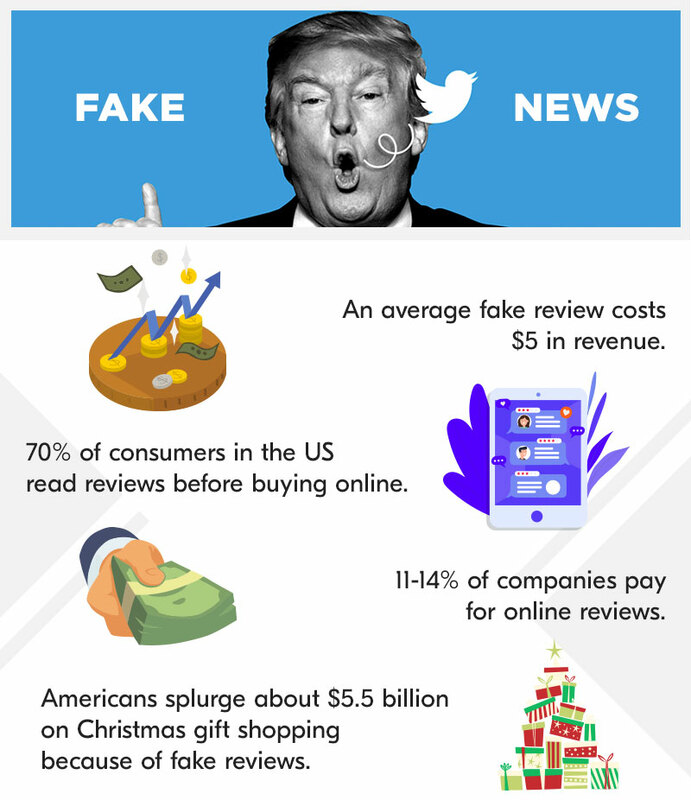 Fake reviews tarnish the reputation of a good company while at the same time promoting a fraudulent one. The reputation of an online enterprise relies on the legitimacy of its reviews. Hence the majority of online operators have increasing concerns regarding the product service reviews found on the internet. Thus, making blockchain technology a crucial source to verify the reviews on their products or services. Deploying blockchain can help curb fake reviews, as blockchain stores data in blocks which is then added to a chain of similar information blocks. Each block requires to be verified across a network of computers before it can be added to the chain – once verified – it cannot be altered. The technology can be employed to create a digital map of someone, one which cannot be modified. Adopting blockchain technologies in business processes can be extremely beneficial for marketing as you can issue redeemable reward points to the customers through blockchain when they cross a specific bar of spending. This will enable the client to benefit from a varied range of discounts and personal offers, at the same time enabling proper tracking of the data making blockchain technology more efficient. The eCommerce marketplace is waiting to be revolutionized by the applications of Blockchain. Although it may take us a little time to witness these implementations – change is definitely in the pipeline. Besides being faster and considerably cheaper, blockchain facilitates most activities that the present day commerce systems allow without causing any third party interference, making it ideal for retailers. Blockchain technology can finally be concluded as the backbone of businesses in the ecommerce marketplace. 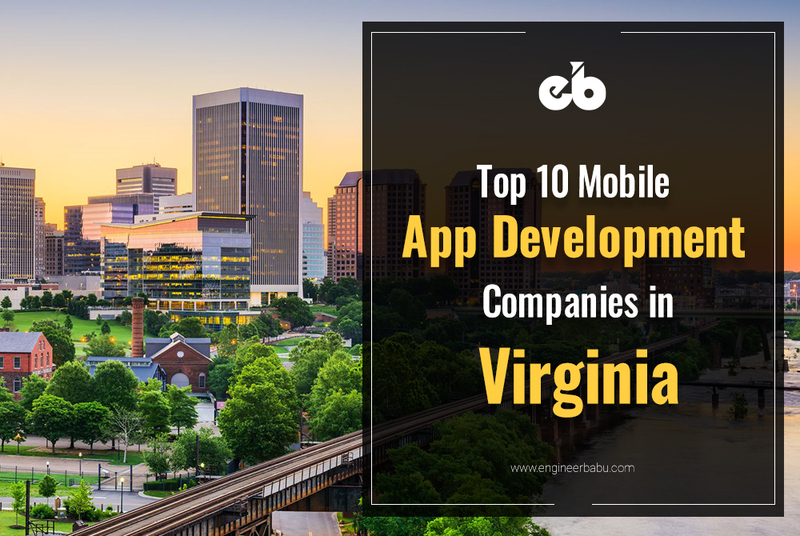 Are you on the lookout for top mobile app development companies in Virginia? Is it your first time getting an application developed for your business? Should you opt for a boutique firm or an enterprise? How will you find the ideal tech partner who can efficiently get your app developed; that too at a reasonable cost? Is your selected company even reliable? The conventional way to find an ideal mobile app development company Virginia or any geography for that matter is to carry out a Google search. When Googled, the search engine delivers countless results including blogs, company websites, advertisements, videos, so on and so forth. But, how do you choose your ideal tech partner from amongst them? How can you know for sure that the selected company will deliver on the promises; and is a trusted and reliable app Development Company in Virginia? Our team at EngineerBabu has successfully solved this puzzle. But first, let us understand how to go about selecting the correct mobile app development company for your specific requirements. The process of choosing an app development company may seem overwhelming at times, especially for those who are doing it for the first time. You might be motivated to base your decision essentially on the cost they quote. However, placing emphasis only on cost risks the quality of the final product. Before price, you should consider other factors like the type of firm you feel comfortable working with, the preferred location of the company, and most importantly – how was the experience of their previous customers. You must read – The cost of mobile app development to get more insights on the pricing structure of different types of application. Boutique firms are smaller companies that specialize in providing solutions to small and medium-sized businesses. They generally cater to a limited or low volume of users. Although, boutique firms, nowadays have started catering to enterprise clients as efficiently as their counterparts. A hybrid app can run on multiple operating systems, such as iOS and Android, though it offers less functionality and design. A native app can only run on the operating system it is specifically designed for. However, these applications are generally speedier and more complex. Some app development companies specialize in either Android or iOS apps and understanding what you are aspiring to build is critical to finding the right team for your project. 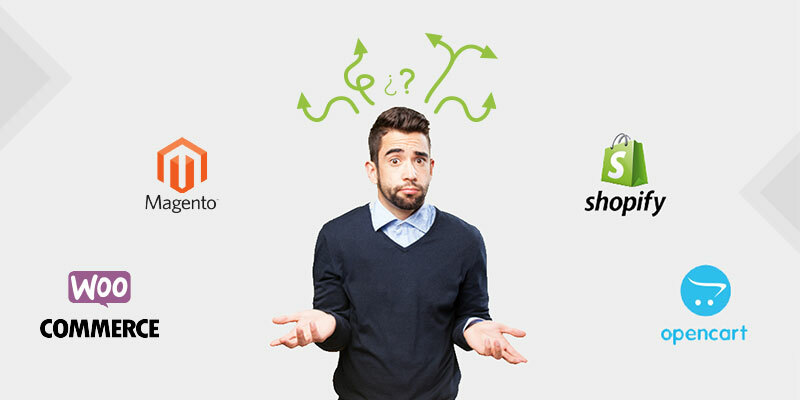 Recommended Read: What’s the right pick amongst Native, Hybrid or Web app, for your business? These are the companies which are located in the same country as you. Communication is much more comfortable as they are located in a similar time zone. Culture or language barrier doesn’t exist. Off-shore refers to countries far away from your home country. The most reliable offshore app development locations for the US include India and other Eastern European countries, such as Bulgaria, and Ukraine. A carefully-picked offshore app development company can offer streamlined communication and high talent, as long as you conduct your research thoroughly and carefully. Recommended Read: How much does App Development Cost? ‘Don’t judge a book by its cover’, they say. This statement holds true for app development companies as well! One needs to be extremely vigilant while selecting an off-shore app development company. 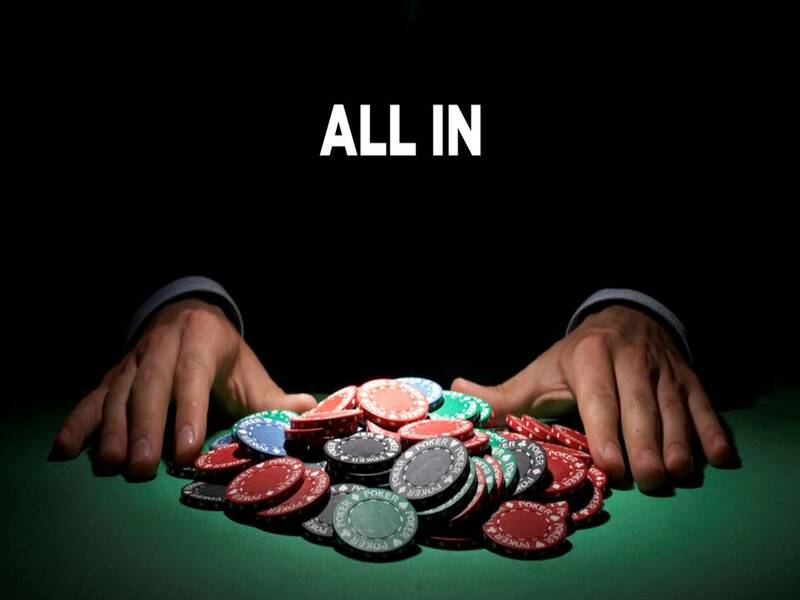 It might not be that big a deal if you are partnering-up with an onshore firm. However, for choosing the right off-shore partner, you must carry out thorough research before you settle on one. No matter how good the company appears on paper, you won’t know for sure if they are right for your project until you engage in a thorough discussion with the technical and management team. If you are interested in a particular firm, ask them questions related to prior projects similar to yours, and how they managed and accomplished those projects. It would help if you also looked at other client reviews on sites like Clutch, GoodFirm, AppFutura, and others. After selecting the right tech partner, don’t jump right ahead into the development stage; instead, first, conduct a pre-research or “discovery” stage. It is strictly advisable to avoid companies which do not offer the “discovery” or the research stage for large-scale projects. If you are still satisfied with your firm’s price, work, and communication after this step, it’s much safer to commit to fully developing the application with them. Established in 2011, Forebear Productions is an IT Development and Services company delivering a wide array of solutions. Their services cater to onsite as well as offshore clients. Forebear Production primary clientele comprises small and medium-sized business (60% and 30% respectively). They have established themselves as a leading provider of app development services in Virginia. Follows a 360-degree approach to the software development life cycle. We’ve received a remarkable response by the quality of the apps they’ve built. Simpalm is an IT consulting and Development Company based out of Washington DC, Metro Area with offices spread across the US and abroad. They have been in the domain for the last ten years and have successfully spearheaded some very ambitious projects of governments as well as enterprises. They have launched over 200 applications spread across varied industries like – healthcare, entertainment, startups as well as government. Experts in Xamarin, and React Native. We were pleased with our investment with Simpalm and think it’s a positive ROI. Recommended Read: How to Build an App like Uber? CodeBright LLC is a custom software development firm based in the Washington, D.C metro area. They develop software solutions for enterprise level as well as startups. CodeBright LLC provides services for the entire development cycle from requirement gathering & prototyping to planning & implementation, to testing & technical support (including DevOps). Versatile clientele from different domains thus have experience of catering to niche markets. We were so impressed that we’re actually thinking of adopting their best practices in our business. Mobelux is a Virginia-based “digital products” company that works with startups and enterprises. Started in 2008, they’ve established themselves as a leading IT firm in Virginia. TkXel is a Reston, VA based Technology Company, known for delivering cutting-edge solutions for web and mobile. They primarily work with startups and medium-sized enterprises looking for quality custom software. They also possess good enterprise clientele as well. TkXel also possesses substantial domain expertise in delivering offerings like Machine Learning, Blockchain, Internet of Things, Big Data and AR/VR. They have been awarded as the ‘Fastest Growing IT Company in the Region’ and the ‘Best IT Consulting Company’ for their services. Family Dollar, ABB, Knowles, Reidmark, Groupon, TELUS, Honeywell, Telenor, Propelics, Vistaprint, F4S, Replenium, Lumatax, CafeZupas, SKGF, WuxiNext Code, Barclays, FamBrands, Inspired eLearning, Groupon. Every company claims to be client-focused, but Tkxel truly lives by this principle. They call themselves “the Mobile Innovation Agency,” and rightly so. WillowTree is a leading ‘Digital Products Agency’ which primarily caters to large enterprises. Having started in 2007, they’ve built over 400 applications being used by millions of users worldwide. WillowTree boasts an impressive client base that includes big corporations as well as medium-sized corporations looking to enhance or expand their offerings. WillowTree’s relaxed internal work culture was a breath of fresh air in an otherwise occasionally staid industry. AgileEngine is a Maclean, VA headquartered software and mobile app Development Company. Established in 2010, they boast a team of 301 engineers who have the experience of working with the likes of some of the biggest corporations and hottest startups of the world. Clutch has elected AgileEngine as the top-rated vendor in the D.C. Metro area. They have also been awarded as the “Top 5 IT Employers in Ukraine” by Ukraine Top, and “Fastest Growing Companies in the US” by Inc 5000. ClickDishes, ActiveCanopy, Centriq Technology, Needles, Logi Analytics, Farmers Edge, XA Systems. Because of them, our clients went from unhappy to happy to even happier as the software improved. Segue Technologies is an IT Development company which delivers IT services primarily to government and non-profit organizations. They have positioned themselves as a reliable tech partner for government agencies and enterprises by offering highly secure and customizable platforms. Since its inception in 1997, they have provided solutions that have supported a wide variety of government and commercial projects using a “customer-first” approach. Headquartered in Arlington Virginia, they’ve also been included on Inc. Magazine’s list of America’s 5000 fastest-growing private companies for four years running. They are also a Microsoft Gold Partner, Oracle Partner, Dell Registered Partner, and an SAP Business Objects Partner. I think the most important thing is the fact that they [Segue Technologies] look at it as more of a partnership. 10Pearls is a digital products development company that helps businesses of all size design, develop, deploy, and maintain software, web and mobile applications. They facilitate businesses to undergo digital transformation by being their reliable tech partner and assisting them on each and every step of the product development process. Established in 2004, 10Pearls boasts a team of 400+ engineers with offices across DC, San Francisco, Toronto, Karachi, Dubai, and Cebu. Their core competencies include AI, Machine Learning, Voice, Augmented Reality along with mainstream technologies. Coshx is a Charlottesville, VA based mobile app and web Development Company. Founded in 2011, they primarily cater to small and medium-sized businesses looking to build an app or a website. Coshx also possesses extensive experience working with clients in the healthcare industry; maintain a focus on software strategy specific to digital health products. Since 2018, they have become a fully remote team based across the US. They truly cared and treated my project as their own. Each company on this list has been handpicked keeping in mind various parameters. This article could serve as a holy grail for you if you are on the lookout for an app development company in Virginia. If you feel we missed out on other good development companies of Virginia, do let us know in the comments below. 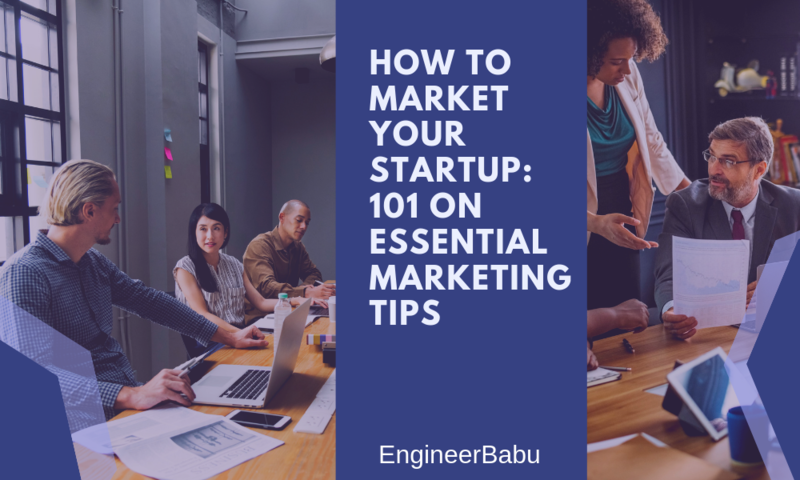 Also, if you are considering getting your app developed by an off-shore company who possess solid domain expertise in building Fintech, ecommerce, ride-hailing or healthcare applications – you must consider – EngineerBabu. EngineerBabu has a talented pool of young engineers building some of the best-quality applications in the industry. Their apps have garnered rave reviews and millions of downloads. Most importantly, their customers have also received huge fundings from investors and VCs. For instance, our cherished Australian customer – Frankgreen, won the “Best Design Award” for not one, or two, but three consecutive years. Another eCommerce customer – Ondoor garnered 100,000 downloads in record time. Check out our portfolio, right here. How to Build a Mobile App like Instagram? New York, without a doubt, can be deemed as the city of hopes and dreams. From high-end fashion brands to finance and even tech – This city shelters almost each and everything. Thus it makes sense to look for your tech solutions at this place. Finding the right Tech Partner or a team can get extremely tricky at times. You need to weigh in several factors in order to make an informed decision. These factors range from Affordability, Pricing Structure, Project requirements, Reviews to even success of their previous work. Even then, there have been several instances where customers got duped because their tech partner didn’t stick to their promises. 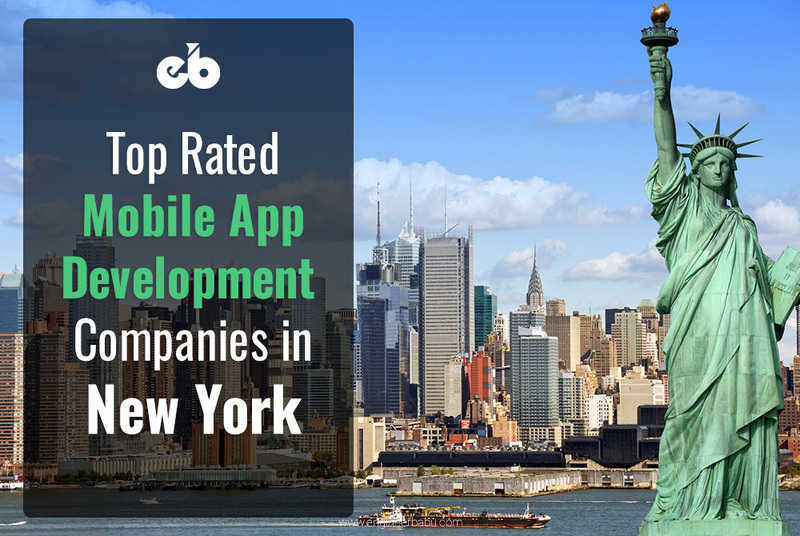 Therefore, after weighing all the above factors, and EVEN MORE, I have compiled a comprehensive and reliable list of the 10 Top-Rated Mobile App Development companies in New York City. My analysis is based on Affordability, Product Delivery Time, Offerings, Cost and especially Reviews. Keep reading and then decide for yourself – Your right tech partner. Fueled are a full-service development, digital design, branding, and strategy company that offers a suite of services for startups and enterprises. According to Clutch, their major service line constitutes, Mobile App Development (50%), UX/UI Design (20%) and Blockchain. Growth & Marketing – Fueled also offers management of digital marketing initiatives for your organization. They have in-house analytics and conversion optimization experts who can help optimize your app’s analytics suite and manage AB testing regimes. Fueled Collective – Fueled collective is one of the top-rated co-working space situated in Manhattan. The space houses more than 30 startups currently and was established with the aim of providing startups a middle-ground to network effectively and efficiently. Barneys, Crunchbase, MGM Resorts International, 9Gag, Harvard University, Rite Aid, Verizon, Afterlight, QuizUp, Summit Series, Happify, Sunnycomb, Matador. Infinum is a design and development agency for mobile and web applications. Having been established in 2005, they possess significant domain expertise in designing and development of web and mobile products. They have offices across New York, San Francisco, Croatia, and Slovenia. Other than this, Infinum also organizes vocational and free training courses to teach students screen design and development under the umbrella – Infinum Academy. Infinum has developed some high-end software for global clients ranging from small startups to large enterprises. Some of their clientele includes Samsung, T-Mobile, Royal Carribean, Universal Music Group, P&G, Crowdstar, Eventim, and Bayer. Dom & Tom is a digital products agency headquartered in New York with offices in Chicago and Los Angeles. They have been recognized as “One of the Top App Development Companies of 2018” by Clutch. Having started in 2009 with a vision fill a gap in the tech domain for the then released Apple iPhone – Today they have expanded their offerings to include iPhone and Android mobile development, web development, along with emerging technologies for Fortune 500 companies and new-age startups. Dom & Tom boasts a dedicated team of 100 employees across their three locations. Their service line includes strategy, User Experience (UX), visual design, iOS, Android, web development, and quality assurance. They also assist in website and application deployment and launch. They have also garnered several awards and recognitions like Inc 5000 –Best Places to Work for in 2018, Crain’s 2017 Best Places to Work in NYC, One of the Top App Development Companies of 2018, etc. Priceline, NBA, Samsung 837, Hearst, General Electric, Turner, Bloomberg, McDonald’s, Houghton Mifflin Harcourt, Tyson Foods Inc., The University of Oklahoma, Private WiFi, Fitch Ratings, Saban Brands, , AARP, Bonobos, Citibank, AIG, ideel, The Emmys, Dignity Health, AmeriLife, Condé Nast, Lisa. SWARM is a digital studio that designs and develops products for corporate and venture clients. Headquartered in NYC, SWARM offers products ranging from mobile apps for iOS and Android, to AppleTV, Web Applications, and even complex technologies like Machine Learning / AI. SWARM classifies its services in four distinct divisions; however, their primary offerings are Mobile App Development, Web Design and UX/UI Design. New venture advisory Market research, market entry strategy, product life cycle enhancement, digital strategy, digital transformation enablement. Prototyping, Digital product design, visual information architecture, customer experience design, and user interface design, service and web design. Product management, product development, Technical architecture, requirements and R&D for digital transformation. Marketing strategy, activation, data science, performance optimization, conversion optimization, tracking testing, and implementation recommendation. Apple TV, Blue Planet Environmental, CBS Interactive, CBS Sports, College Sports Live, Advance, PartyUp Player, Quidd, FreshEBT, Admittedly, Emojiface, GolfMatch, Soledad O’Brien Foundation, LookLook / SPARK, StandStant, Thoughtbuzz, BuyUp Index, LFGer, Propel, Shiftwear, et al. FUZZ is a mobile app development company based out of Brooklyn, New York. Fuzz specializes in designing and development of iOS and Android applications for iPhones, iPads, Android handsets, and tablets. Their clientele is spread across a range of domains, including, Entertainment, Media & Publishing, Hospitality, and mobile-commerce. They are uniquely positioned to collaborate with product and platform managers of global organizations to manage, create, scale and evolve their product ecosystems. Utility specializes in developing custom mobile applications and web software for startup ventures and Fortune 500 companies. They have served some of the most notable players of the domain and have positioned themselves as the trusted tech-partner for big enterprises and startups. Android & iOS Mobile Development, Web & App Development, AR, VR & AI, UX Strategy & Design, User Interface, Research & Discovery, QA & Deployment. Startup Ventures: TOOR (Shark Tank), Kickwheel, UrLife, SirenMD, dearduck Mobile Games: Stride Gum (Mondelez), AVP Pro Beach Volleyball, Wiz Khalifa. Lotus Technologies is an up-and-coming app development startup based out of Broadway New York. They have established a quirky model of product development under which they provide “Unlimited App Development for One Monthly Rate.” Under their monthly model, Customers get unlimited maintenance, unlimited addition of features as well as unlimited support and maintenance for a fixed monthly price. Having been established in 2016, they have already garnered several accolades and recognition for their applications. Their service line entirely constitutes mobile app development for Android and iOS. Ambro, Thrive Global, Convey Clothing, Covet Delivery. Sneakers Agency is a full-service digital product development agency based out of Soho, NYC. They provide complete product development promotion, sales, and marketing services to help brands at every stage of their product development. Established in 2014, they have over 50 clients from start-ups to enterprises, to non-profits, and partner agencies. Their key offerings include – Mobile app development, Web development, Product strategy, User research, User experience design, Prototyping, Interaction design, user testing, Brand identity. MojoTech is a web and mobile app development company headquartered in Rhode Island. It started out as an engineering-only consultancy. Now they have expanded their offerings keeping in mind the demand of the market. MojoTech, now offers web, mobile, and IoT development services as well. With offices across New York, Washington, Boulder, and Providence, their offerings comprise the complete product development cycle – from ideation to realization. Groove, Navionics, AccuWeather, Aetna, Blue Cross Blue Shield, Risk I/O, SendGrid, Swipely, Teespring, United Way. Rose Digital is a boutique digital agency based in Manhattan. Their core expertise lies in designing and developing web and mobile application architecture, deployment, and maintenance at scale. They serve private companies, government entities and SMB’s. They have established themselves as a reliable company in the mobility space within a short period. All the aforementioned companies offer some of the best app development solutions in New York City. These companies have very impressive portfolios and maintain some very impressive clientele as well. While deciding on which of these companies to leverage for your business or enterprise, you need to keep in mind your unique business requirements and then narrow down your choices wisely. Feel free to reach out to us in case you need any help. Also if you feel that we missed out on some good companies, do let us know in the comments below. 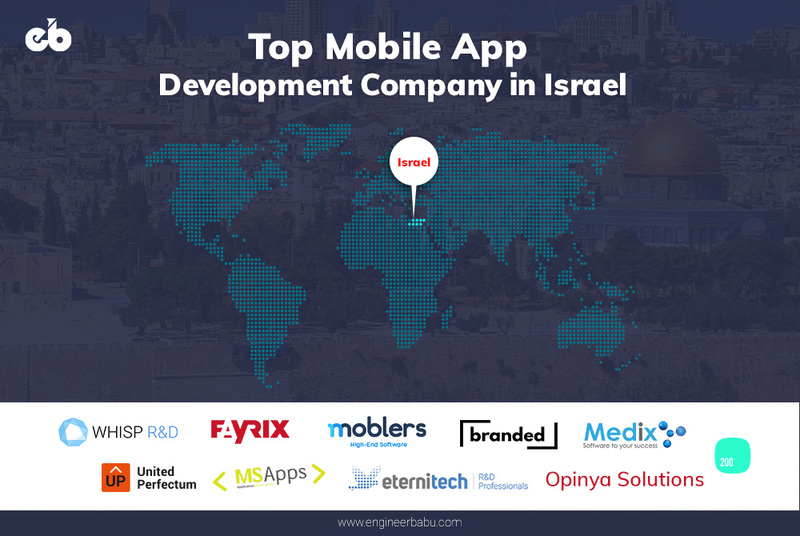 Have a look at the 10 Best Rated Mobile App Development Companies of Israel. This list has been prepared on the basis of Services Provided, Affordability, Reviews, and Customer Satisfaction. We are a decade into the Smartphone era and have already witnessed some significant overhauls due to it. Now is the age of newer and much-advanced technologies like AI and Machine Learning. Thus, every business is looking forward to leveraging them due to their immense potential. As the smartphone user base is on the rise with every passing second, and more than one-third of the world’s population is using smartphones – It makes sense to get an app developed for your business. If you already have one – Now is the time for some major makeover. The latest generation of smartphones boasts some pretty amazing functionalities, and it is imperative to utilize these functionalities for your business use-case. If you don’t already have an Android or iOS application (I suggest both!) for your product or business, you are lagging behind. I am saying this because mobile phone applications are an integral part to ensure the growth of businesses today. They not only provide greater customer satisfaction but also considerably boost the revenue of firms. They establish a direct interaction with customers which is vital for the success of any organization. One country which offers state-of-art app development solutions is Israel. Israel is called the Startup Nation for a reason! They boast a humongous base of new age startups providing some of the best solutions on the planet. Thus, it makes total sense to leverage the technological capabilities of startups and enterprises of Israel for your business. After much research, I have come up with a list of the Best Mobile App Development Companies of Israel. These companies can efficiently serve as your next tech partner and help scale your business to greater heights. This list has been prepared on the basis of Services Provided, Affordability, Reviews, and Customer Satisfaction. Here are the best ten app development companies which offer affordable and cutting-edge technology to develop applications for business enterprises. MSApps was started in the year 2010 and began by developing and maintaining native iOS applications. Located in the center of Tel Aviv’s diamond district – they have expanded their offerings to include native iOS, native Android, full stack, games, AOT (Apps of Things), and VR. MSApps boasts an impressive clientele including some very impressive customers like AutoDesk, PIMA, drippler, thernica and many more. 80% of their service line comprises mobile app development, while UX/UI & Application Testing contributes another 20%. Fayrix offers custom and offshore software development solutions for clients worldwide. They have extensive experience of 14 years and a dedicated team of 1500 engineers. They also boast 10 R&D centers across various countries helping them come up with some of the best and state-of-art solutions for their customers. Fayrix offers a wide range of services including, Big Data, Front-end, Back-end (PHP, RubyonRails, Java, Hadoop, Oracle, PostgreSQL, NodeJS, MongoDB, C#, Go Lang, Oracle, MySQL). And mobile development (Kotlin, Java, Swift, Objective-C, C++, C#). Their majority clientele comprises Custom Software Development (30%), BI and Big Data Consulting (30%) and Mobile App Development. The majority of their projects are protected with NDAs thus their clientele isn’t publicly known. Although they have developed data science solutions for the largest DIY retailer and has augmented IT teams for top 2 banks in Eastern Europe. Based out of Tel Aviv-Yafo, Branded is an up-and-coming mobile app development company providing well crafted and seamless IT solutions for their clients. They primarily target up-and-coming startups and provide them with affordable app development solutions. Their service line majorly constitutes mobile app development and UI/UX solutions. STACY: Connecting fitness coaches and followers in such a way that saves time. Opinya Solutions is a web development and consulting agency specializing in Ruby on Rails, Angular, Node and React. 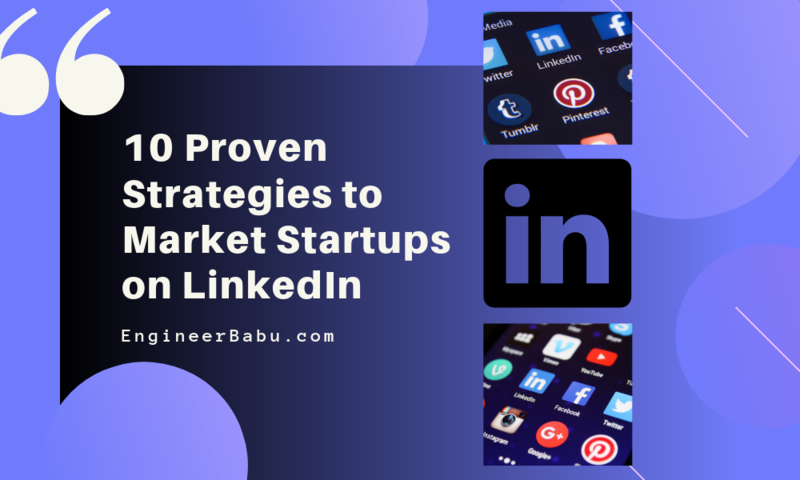 Although they are relatively new in the market, they have proved their mettle by developing some terrific mobile applications and garnering rave reviews for it. They use a clean and simple process for development and consulting maintaining their focus on the final product. Their clients range from single entrepreneurs to companies who are in search for a scalable and flexible solution. Opinya solutions also provide consultancy for startups, assisting them in setting up their tech foundation. Wix, HP, Mellanox Technologies, Perion, Fiverr, etc. Moblers is a professional, award-winning, mobile development boutique located in Kibbutz Haogen, Israel. Established in 2007, they possess substantial domain knowledge of creating mobile and web applications. They possess a broad clientele in the likes of, IKEA, Orange, 365Score, NextTo, etc. Also, applications developed by Moblers hold an installation base of over 100 million. The company also offers a wide range of development services for iOS and Android apps based on newer technologies such as AR (Augumented Reality) , VR (Virtual Reality) and Mixed Reality, through IoT, m-commerce, m-health products to complex mobile solutions, and chatbots. Moblers also provide specific solutions like mobile strategy consulting, product management and design, spacing requirements and even outsourcing of own professional developers. They call themselves, a One-Stop-Shop for all the technological needs of any company. Moblers have bagged several accolades for their award-winning applications from GSMA Shanghai, GSMA Barcelona, Seoul Digital Forum, Asia Smartphone, and App Contest. 200apps is a leading app development company located in Jerusalem. Founded in 2014, they have a dedicated team of 20-30 passionate engineers, UX strategists, and app designers. They are an absolute delight for entrepreneurs with crazy ideas. In their words, “No matter how crazy your idea is, we will build it into a product your users will LOVE!.” They exclusively design mobile applications for Android and iOS and offer an array of services that are unique to each project and each client’s requirement. Their service line comprises primarily of mobile app and web development services. Their key clients include Inpris Ltd, Acceleradio, Topscan LTD and Landbridge Ltd.
Eternitech is an established Online Web and App Development company based in Tel Aviv, Israel and was started in 1993. Eternitech began by developing custom-designed software products and later transitioned to offer more extensive IT services like web, desktop & mobile applications, web sites, systems, application add-ons, browser extensions, plugins, software and hardware integrations, and many more. Eternitech now offers any custom online web development services of variable complexity to clients worldwide. They have a track record of efficiently employing the latest tech stack with utmost efficiency. Their major tech offerings include three.js, Java, React, Zend framework, YII, and WPF. Technion Israel Institute of Technology, Ness, LivePerson, CoudZone, Matrix, Golan Telecom, Mapa, Kramer, Varonis, Bat Yam , and IPG Reuveni Pridan. Whisp is a boutique software development company which specializes in delivering high-quality web, mobile and enterprise software. Founded in 2016, their founding team has a long history of collaborating with startups. They specialize in delivering high-quality web, mobile and enterprise application products. Whisp also boasts relevant expertise in tackling some of the most complex projects using innovative tools and techniques such as Domain Driven Design and Microservices. The tech stack they employ includes React, Angular.js, Java/Scala (Akka, Axon), Python (Django, Flask), Node.js, C# (WPF, WCF, MVC), iOS (Obj-C, Swift), Android, React Native. United Perfectum is a software development services company headquartered in Kfar Saba, Israel. They provide a wide range of services including web development, application development, and others. They have offices in Israel, Lithuania, USA, Canada, and Ukraine. They have been in the field for the past 25 years, their work is spread across 22 departments and has a team base of 1,500 employees. If you are a healthcare company or a startup looking to improve your offerings, then, Medix can be an appropriate partner for you. Medix software specializes in the development of medical systems. Started in 2008, they carry substantial domain proficiency and have established themselves effectively in this niche market segment. Their software expertise and familiarity with the healthcare process and standards ensures shorter development cycles and quality code delivery. They extensively work with medical companies and startups who want to create high-end healthcare software. Lots of research has gone into creating this comprehensive list of the ten best app development companies of Israel. Other countries can readily look forward to leveraging the capabilities of these companies as they have a worldwide presence and provide some of the best solutions out there. What would you like to read about next? Do let us know in the comments below if we missed any company. What is omnichannel retailing? How to establish an omni-channel business network? Is there a difference between a multi-channel and omnichannel approach? Do businesses really need to employ omni-channel approach? Why omnichannel? These few questions seem to be on everyone’s mind lately. Owing to the tremendous growth eCommerce has witnessed in the past half-decade, it is evident that businesses will be looking to seek benefits of omni-channel retailing. But what exactly is omni-channel retailing? Do I need to employ this in my business strategy? There seems to be a lot of conundrum revolving around this topic. But worry no more because we’re here to answer all the questions surrounding omni-channel. Stick around till the end of this post, and I assure you that none of your questions will go unanswered. Since Adam, commerce used to be single-channel, meaning the retailers owned a physical brick and mortar store through which sales occurred. This model was a tremendous success considering you didn’t require significant expense other than setting up your store. Since times evolved, this channel became obsolete as it encountered many limitations. As the age of the digital revolution befell and smartphones & tablets came in picture – Customers demanded a more comfortable approach. 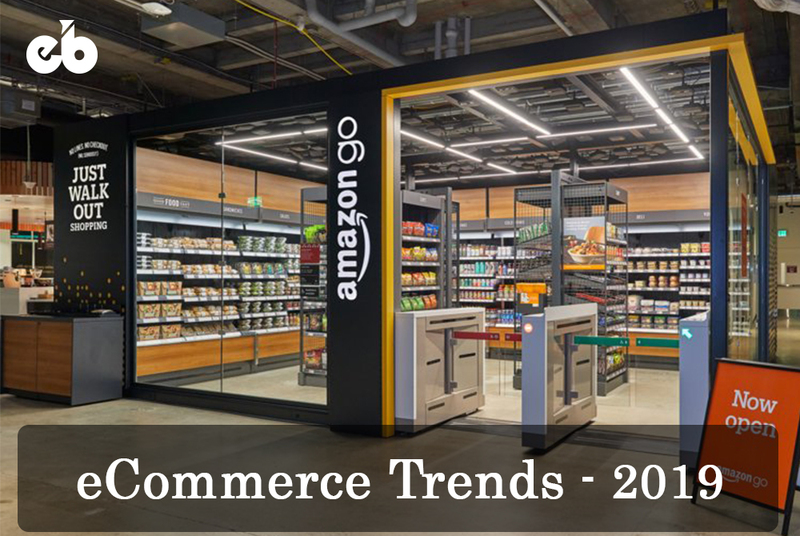 Thus, retailers shifted their focus to a more diversified strategy to broaden their offerings. Consequently, the multi-channel approach was born. Leveraging multi-channel consumers were able to shop from different channels as per their preference. Multi-channel approach provided the needed flexibility and convenience required for consumers to purchase goods and services. This approach observed tremendous growth and proved hugely successful. But with time, people started noticing its limitations as well – Although this approach was beneficial having bought round-the-clock access to customers, but lacked in providing a seamless experience across different channels. And, as more and more data got accumulated, it became relatively critical to introduce coherence amongst different platforms. Moreover, customer service was also a big concern since retailers communicated with shoppers in multiple channels and became perplexed with data synchronization in separate systems. Customers now are more demanding. They don’t want to be limited by their geography and not have access to some commodity that might be available someplace else. Besides, they wish to seamlessly manage purchases across different channels and not struggle with order fulfillment and delay in delivery. 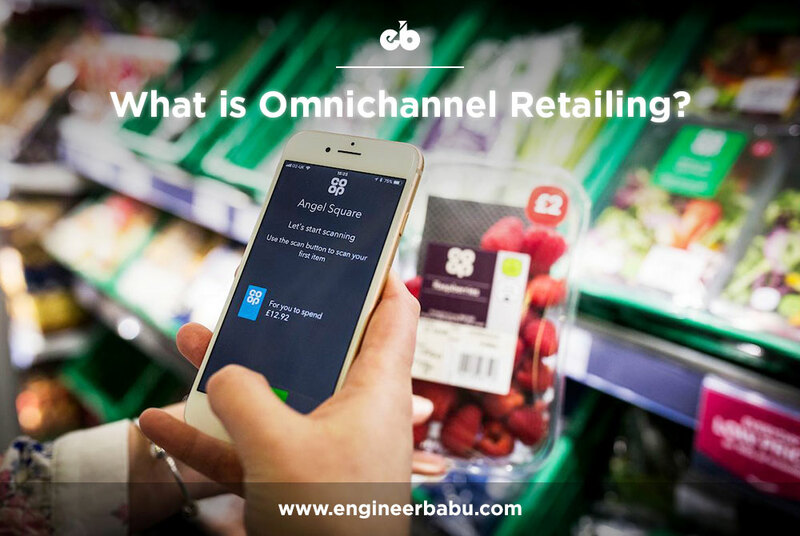 Pertaining exclusively to eCommerce, omni-channel retailing is an integrated approach to commerce aiming at providing a unified shopping experience to consumers across all platforms. Omni-channel retail requires centralized management of data sources to ensure a demographic view of that data. As a result, customers can wishfully use different channels in their shopping process, commencing their search at one and finishing-up the purchase at another. Many people believe omni-channel to be an extension of multi-channel retailing, though this isn’t exactly the case. Both omni-channel and multi-channel follow distinct business models. Using multi-channel retailers implement as many channels as possible but there is no coherence amongst them, each channel is managed separately. On the other hand, the omni-channel approach offers an integrated solution where there is centralized management of data amongst all channels, thus establishing a symbiotic ecosystem. The above stats clearly indicate an already underlying fact that multiple channels help generate more sales. 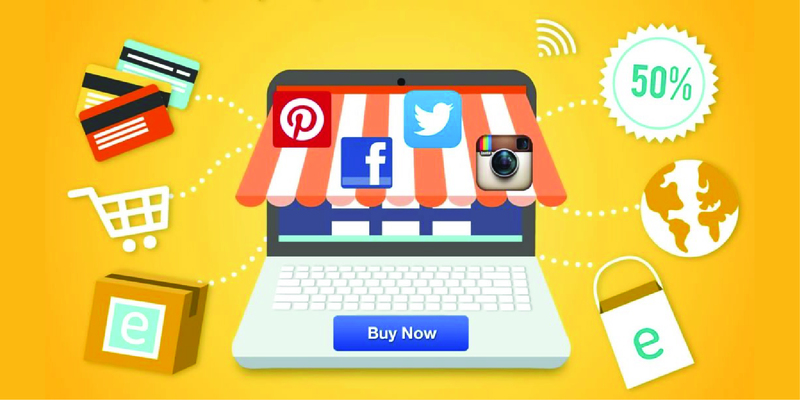 Harnessing omni-channel efficiently can boost your sales in no time. This is because shoppers that engage with retailers on multiple channels make purchases more often. 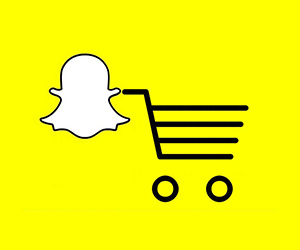 Do businesses really need to employ an omni-channel retail strategy? Since the dawn of the internet and all things related, every business is expected, and in fact, SHOULD, have an online presence. Entrepreneurs who got-on early on this bandwagon, and realized the importance of this extremely lucrative domain are still ruling the roost! (Amazon is a good example, I guess). Several studies conducted over time have proven time, and again that multi-channel is the way to go. Owing to the fact that consumers nowadays want everything at their convenience, and having an online presence gives institutions that opportunity. However, the demand now is not just having multiple channels to shop through – Consumers, now, are also looking for seamless integration across the numerous platforms they utilize throughout the day. Hence, it is extremely critical, especially now more than ever, to adopt the omni-channel approach if you want to expand your business. 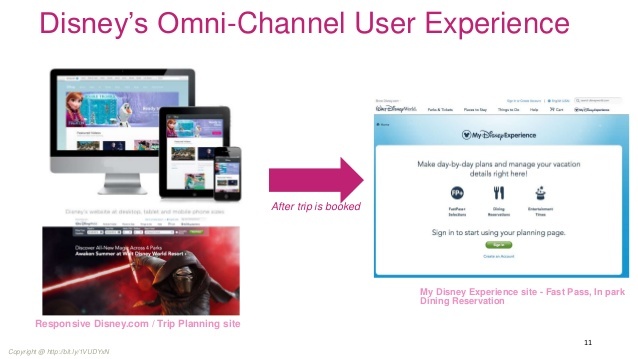 Disney has gotten the omni-channel experience right to the minutest of details. Disney’s trip planning website works flawlessly across all mediums like mobile, tablet, desktop, etc. Also, it seamlessly integrates across all your devices providing synchronization with the bat of an eye. 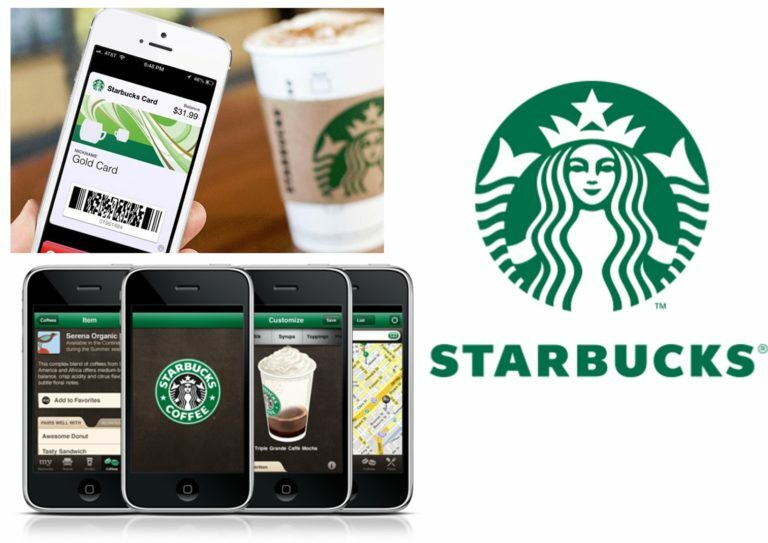 Starbucks is also leading the herd when it comes to providing one of the finest omni-channel experiences. Standing in line to get your morning cup of Joe and realizing you don’t have enough balance in your account, is the side of the town where nobody ever wants to get to. Starbucks has now made it possible to check and reload your card via phone, website, in-store, or on the app. Any change to the card or your profile gets updated across all channels, in real-time. With omni-channel, it’s all about making the customer’s life easy. It becomes especially frustrating when there isn’t seamless integration amongst platforms of the same application. For instance, imagine yourself ordering food from your favorite restaurant to discover half-hour later that the restaurant hasn’t even received your order yet. A situation like this nullifies the whole point of adopting this medium in the first place. Zomato (an Indian food ordering service) seeks to eradicate this frustration with its flawless user experience. You can easily track your delivery guys’ movement in real-time across multiple platforms. 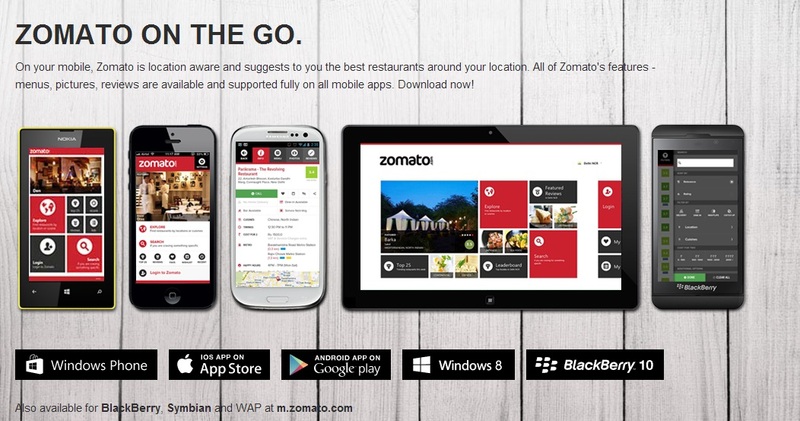 Plus with its easy-to-navigate tools that provide on-the-go ordering access, Zomato does a wonderful job at that too. Since you now understand why it is crucial to implement the omni-channel retail strategy in this day and age, let us now understand as to how exactly can you do it. The first step that goes into establishing a seamless omni-channel retail strategy is in clearly chalking up your target customer’s persona. This includes understanding which devices, platforms or medium your customers utilize regularly. Sieve through your Google Analytics report and develop a clear elucidation of your customers’ demographics, geography, and concentration. Secondly, try and analyze how customers are discovering your business. Once you gather and analyze all this data, you can proceed with implementing strategies accordingly. Analyzing this data will help you gain a broad understanding of the most important touchpoints for your business. 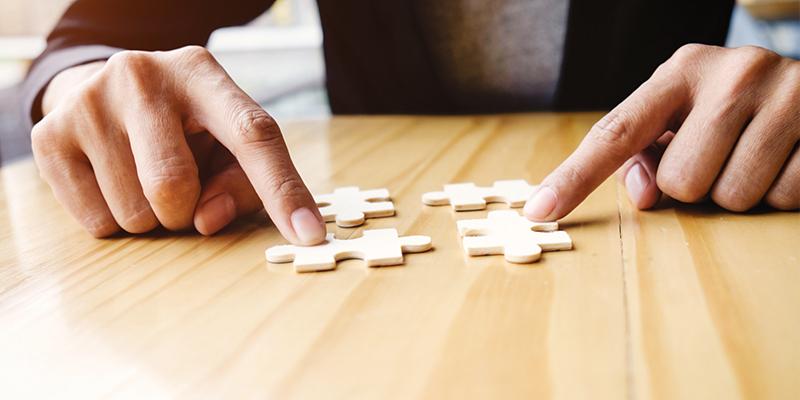 Now that you’ve nailed down specific platforms to streamline or improve, it’s time to build off of that understanding for an omni-channel buying experience. You need to bridge the gap between the online and offline shopping experience because customers now, don’t like wasting time visiting your store if they aren’t sure whether their desired product will be on the shelf. 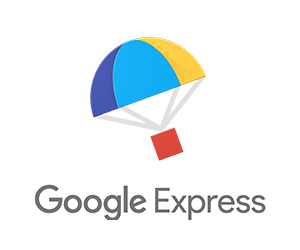 To address this, you can integrate your eCommerce platform with Google. Applying this will assist the user to directly go from keyword search to product location to buying it and picking it up in-store. It is no secret that technology is rapidly evolving. We have come so far from the phase when you needed a desktop to access the internet. The inception of the first iPhone was a total shift in paradigm where your handheld device was able to seamlessly access the then growing realm of the internet. No one has been able to make it big, all by himself! 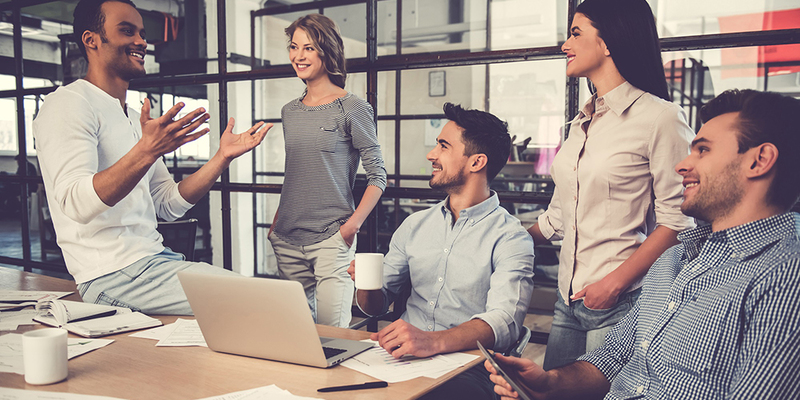 Teamwork goes a long way in ensuring the overall success of any organization. Especially, in case of omni-channel retailing, you need to strictly ensure that all the cogwheels of your supply chain are working coherently. 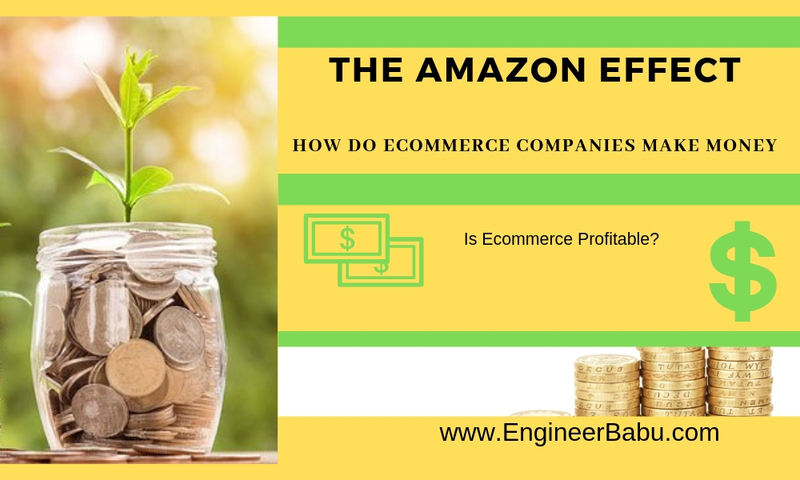 EngineerBabu specializes in designing some of the best seamlessly-integrated eCommerce solutions out there, and we are more than willing to share our substantial domain expertise for the benefit of your organization. You can also contact us for a free consultation. Feel free to drop your comments in the section below, in case you have any doubts. Hosted vs Self-Hosted Platforms | The Final Verdict! It’s hard to ignore the substantiality of eCommerce considering that just over four percent of the American population has never ordered anything over the internet. So, people seem to be readily accepting mouse over mall! It does make us fathom the far-reaching capabilities of eCommerce. Eyeing the lucrative nature of this domain – Everyone is trying to grab a piece of this giant pie; it makes sense that businesses of all magnitude will look forward to swimming in the pond! Let’s begin our discussion by first understanding, what is meant by hosting. So, purchasing space on the internet is the same as buying real estate. As in the real world, where you either own or rent a space for yourself and your family to live – Hosting is the real estate upon which your website lives. 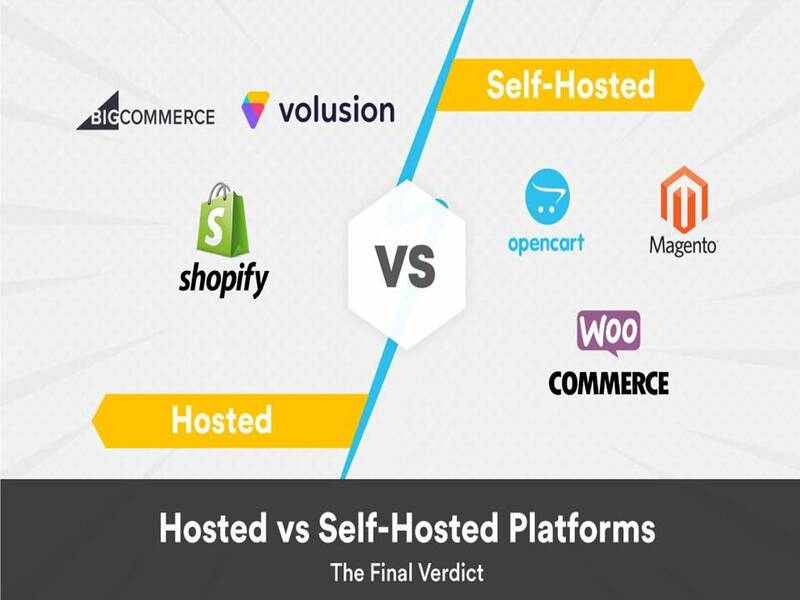 Now, eCommerce platforms – or the software used by online retailers – can fall into two categories: self-hosted & hosted. There has been a constant battle to figure out which one is better. So, let’s put an end to this discussion once and for all, shall we? Self-hosted platforms are open source applications that function through web hosting. Self-hosted platforms are decentralized, meaning you aren’t dependent on any centralized service and are free to choose your hosting service. This enables extreme mobility when your customers increase. Installing a self-hosted platform is the same as installing WordPress, and setting up an eCommerce platform is similar to setting up a blog on WordPress. Being open-source enables a vast range of customization. However, you will require a skilled developer to make any needed changes. 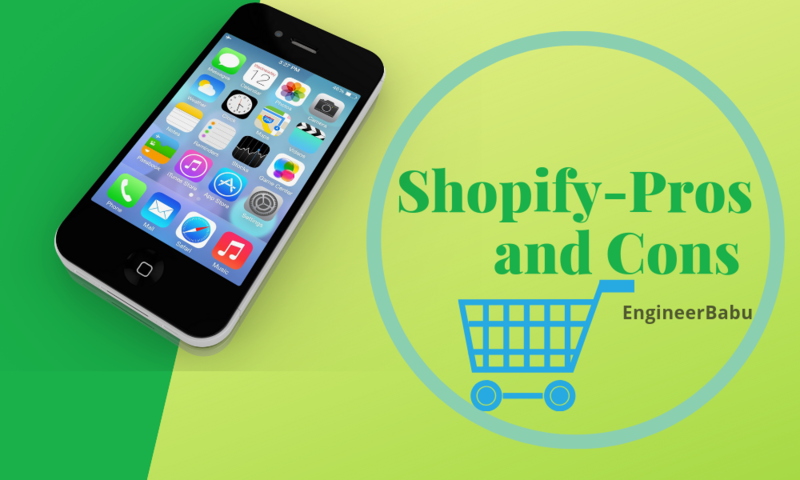 They also offer complete control over each element of your online store. Besides, you can also ask your developers to create some additional plugin, if required. Self-hosted platforms seem perfect, right? Don’t make up your mind just yet; wait till you learn about the platform on the other end of the spectrum. Let’s delve into its counterpart, shall we? A Hosted platform is like a Swiss Knife. They are basically a one-stop-shop for anyone who isn’t ready to bear the nuances of a self-hosted platform. Hosted platforms are perfect for you if you don’t have the time and workforce to manage your store. In hosted platforms, the provider will charge a monthly or an annual fee, and will maintain your site and make sure everything runs smoothly. You do not need to worry about incorporating customization or changing the code – Your provider will do everything. Another vital factor is that hosted platforms guarantee total security. Professionals who maintain the server ensures security. Sometimes, the feasibility of a platform or a product makes no difference if a business can’t afford to employ it. Thus, it is critical to keep prices as sustainable as possible. The hosting part of the business represents the most substantial portion of the cost considering the total cost of building your online store. You need to keep in mind several details while deciding on the price of the platform you wish to employ as the cost of additional elements like web design, support and SEO also needs to be taken into account. 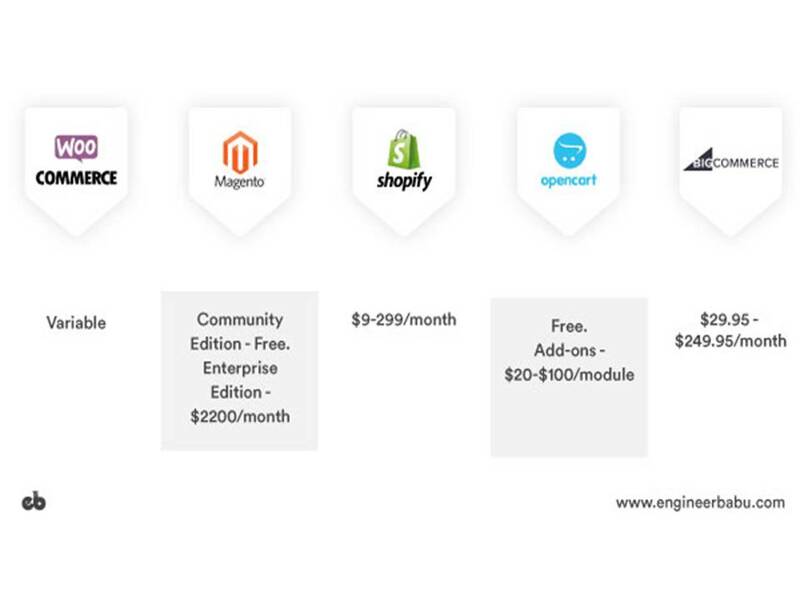 With Self-Hosted sites, the majority of your expenses and cost to set up is upfront. You will need to set-up your site all by yourself or will have to hire a skilled developer. This again may not be the most frugal use of your time, especially when you are just starting out. Also, the cost of maintenance is generally much higher for a self-hosted platform when compared to a hosted platform. On the other hand, Hosted platforms work on a subscription model, where you need to pay a monthly or annual subscription fee to the provider. Other costs involved with self-hosted platforms aren’t applied here, like the cost of developing and maintaining. WINNER – HOSTED Platforms – The initial capital required is minimal. Self-Hosted platforms offer a range of customization as they are easily configurable. You can design your custom platform according to your whims and fancy and won’t be limited by the capability of the platform. You may need to hire a skilled developer, efficient enough to create customization. This may be the best option for you if you have a large enterprise and have an initial capital available. Moreover, with a hosted platform you will get an out-of-the-box solution which could be set up in a day. They also don’t require a more significant capital to set up. However, keep in mind, you won’t be able to provide a unique customer experience and will be limited by the constraints of the platform. WINNER – Self-Hosted Platform – Offers better & Unique Customer Experience. Setting up an eCommerce website isn’t easy, and you won’t earn a fortune in the beginning. Instead, it is extremely plausible that you may end up losing some. So what’s the kill here? I think what you need to aim for in the start is Customer Satisfaction. The volatility of this domain makes it critical to ensure that the products and services you are offering should be dependable. You need to ensure that you earn your customer’s trust by providing a channel which is extremely safe & secure and also adheres to all the necessary compliance. Self-Hosted is a DIY (Do it yourself) kind of platform where you are the heart and soul of the business. It is on you, to ensure that your platform is secure and efficient all the time. Then again, to provide this, you will need to hire skilled web developers. Assistance with the software, in Hosted, is included in the monthly subscription fee that you pay. Most of the technical aspects are taken care of by the service provider themselves. However, an additional cost will be incurred for ensuring an extra layer of security. WINNER – Hosted Platform – Reliability is providers concern. You could have launched the best online store out there! But does it really matter if customers can’t find you because of low Google ranking? 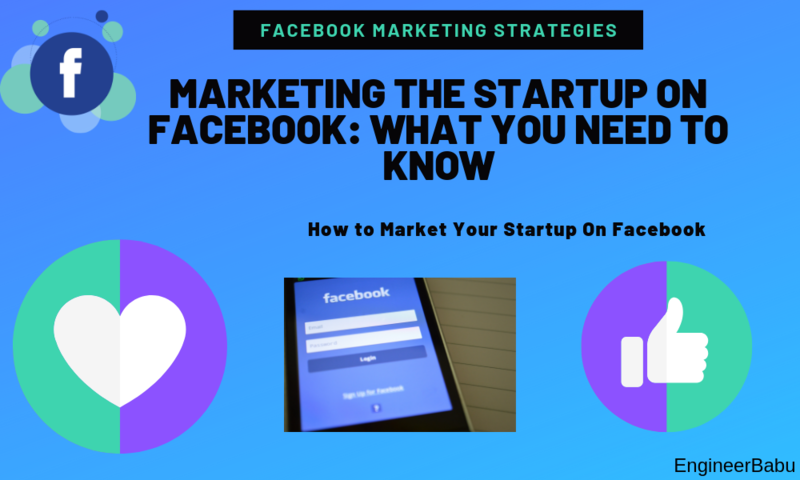 I have witnessed many eCommerce startups spend a ton of time and money in developing their eCommerce website, and at the time of marketing, they sort of lag behind as they overlook allotting a proper budget to market their site. SEO makes your website noticeable in the ocean of thousands of other stores. Self-Hosted Platforms will require you to set up the whole process yourself. You will need skilled developers to install SEO optimizations at the time of building the platform. With Hosted Platforms, you won’t need to waste your time and efforts on setting up SEO Optimizations and other marketing initiatives as they are already included in their offering. I strongly recommend you to choose a platform that has the whole marketing package and can provide you with SEO, Social Media Marketing, Pay Per Clicks, Reviews, etc,. WINNER – Hosted Platforms – Already Optimized for Marketing Initiatives. How much capital are you planning to spend on setting up your store? How many products, on an average, will you have? What are your business requirements from your store? How much cost are you willing to spend in operating and maintaining your store? Is there any monthly budget allotted for your site? Do you require 24/7 technical support? Who would look after your site’s SEO? 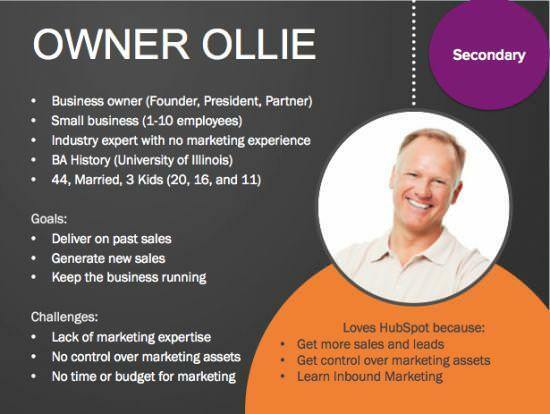 Have you assigned a budget for marketing initiatives? Creating a custom or a self-hosted website is like rewriting a code which has already been efficiently written. It would’ve been good to employ a self-hosted platform during the 2010s, but we have come a long way now. Hosted platforms are already efficiently scripted, and you don’t even have to worry about maintaining and upgrading for features and functionalities! 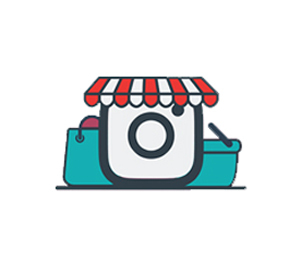 Using these ready-made platforms can help you start your store at a reasonable cost and within a matter of a few days. You even have the option of customizing as per your whims and fancies. So don’t waste your time, efforts, money and opportunity. Instead, look at how to win a new customer and generate business. It’s Simple until you make it Complicated. Our team at EngineerBabu are experts in developing eCommerce solutions. We have designed some brilliant eCommerce platforms for customers worldwide. Our dear Australian eCommerce customer Frankgreen won the Best Design Award for not one, two, but three consecutive years! Contact Us for a free consultation call, we would love to help you out. Also, feel free to drop your comments in the section down below. This is what our customers have to say about us. How Can AI Help Small Business? When Apple introduced its first iPhone – it was literally a shift in the paradigm of what we always viewed phones to be. Since then, there have been several significant evolutions in technology, but nothing can compare to the biggest of them all – Artificial Intelligence. AI is having a bearing on almost every conceivable thing and I suppose I don’t even need to elucidate on the broad applications of this incredible new domain. Naturally, it was about time the benefits of AI be implicated in the most lucrative business of the 21st Century – eCommerce. 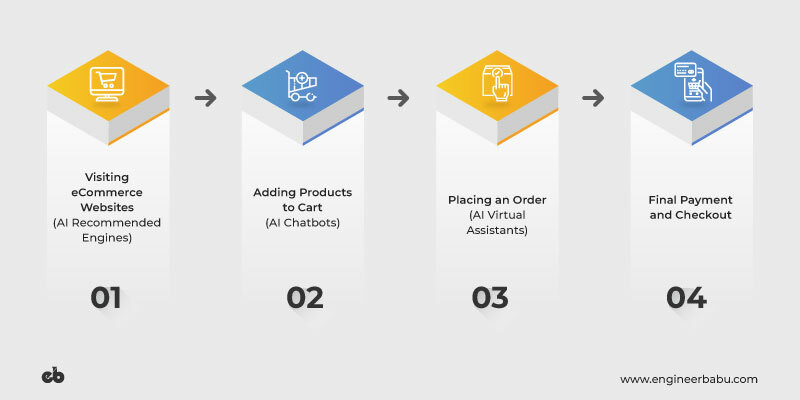 Every significant step like Visiting the retailer’s website, Adding products to cart, Placing an order and even Checkout can be automated using the capabilities of AI. Almost every significant step of commerce over the internet can be transformed by implementing AI. 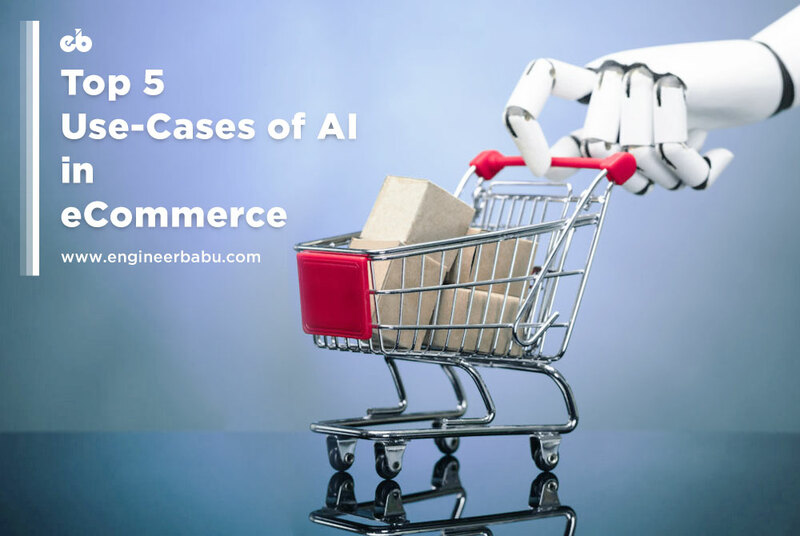 In this article, I would try and shed some light on the practical and significant use-cases of AI in eCommerce and how your eCommerce business can leverage it at this moment in time! There seems to be a lot of conundrum on the subject of AI in eCommerce, so let’s put an end to this discussion, once and for all, shall we? It has been observed that customers end up abandoning their purchase because often the product results displayed turns out irrelevant. Through AI organizations are trying to display customer-centric search results that are relevant to their desired ask. eCommerce websites are increasingly leveraging NLP (or Natural Language Processing) and Image Recognition to better comprehend user language and produce better product results. Yandex, a popular search engine, successfully implemented some advanced applications of NLP and Deep Learning to optimize future searches with the help of the data of previous searches. This turned out to be a massive success as they were able to increase their click-through rates by almost ten percent. Clarifai is trying to improve ecommerce by building smarter applications which can see the world as people would. In their words, “Artificial Intelligence with a Vision.” These applications enable the developers to build more intelligent apps and at the same time empower business by providing a customer-centric experience. A demonstration of how Pinterest Lens work. Pinterest is partnering with ecommerce stores for its new offering Pinterest Lens to find matching items in the store directly from their image on Pinterest. This is great from the standpoint where people generally abandon their search because they aren’t able to find the relevant product. Developments such as these are not just helping businesses generate better revenues, but are also reducing customers’ journey. 2. Shopping Experience Level 1001! 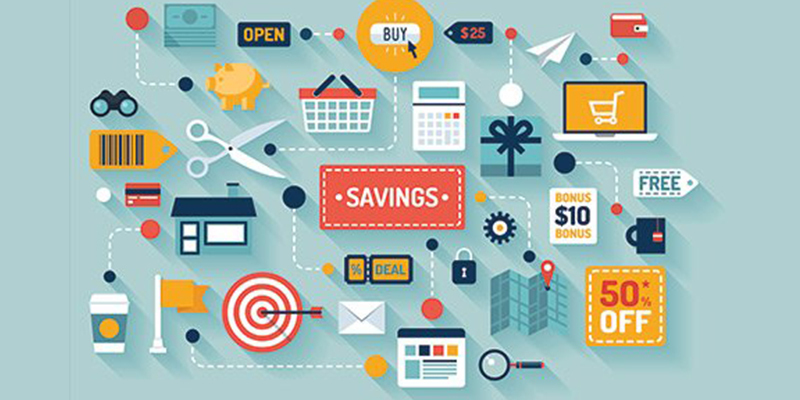 How do you enhance the user’s shopping experience? Make it as real as possible! If you want to understand just how much Google knows about you, go check out your Google Maps Timeline! The devices that you use collect and store a ton of information about you. This data is extremely valuable as the right type of information can enrich and improve your shopping experience. Deep Learning and Machine Learning technologies are able to utilize the smallest piece of data. For instance, even the hover that you made over a product is analyzed and evaluated to understand the likelihood of you buying that product. In practice, this personalization helps deliver images of related products, enticing offers related to the product, alerts related to that product, and dynamic content that alters according to demand and supply. AI engines such as Boomtrain acts as a bolt-on with your existing customer channels and helps businesses analyze how customers are interacting online. It also provides a unified view across all devices, monitoring and analyzing performances across different platforms. Companies like Criteo, are assisting Internet retailers to serve personalized online display advertisements to consumers who have previously visited the advertiser’s website. Through cross-device advertising, they are able to engage shoppers wherever they are online with premium-placed ads across desktop, mobile and social. AI is assisting in generating deep and relevant insights of data by analyzing and scanning through terabytes of data to efficiently predict human behavior. This scale of intelligence helps deliver a personalized shopping experience for the end user. There’s a massive insurgence of fake reviews aimed at tarnishing the ratings of a good product. These reviews not only makes good products rank below but also cost companies billions of dollar. These stats are absolutely insane! Customer reviews are an integral part of the sales cycle. 87% of customers trust what they read without the blink of an eyelid. The last couple of years have seen a surge in talks around this subject and has consequently impacted the way customer perceive information they encounter online, even if it is ostensibly written by a credible source. Artificial Intelligence is increasingly being deployed to analyze user reviews. For instance, Yelp has deployed a sentiment analysis technique to classify their review ratings. Through this technique, they organize the information into different data sets like business_id (ID of the business being reviewed), date (Day the review was posted), review_id (ID for the published review), stars (1–5 rating for the business), text (Review text), etc,. On similar lines, Facebook has come up with their AI solution “fastText” for text classification and create supervised as well as unsupervised learning algorithms to obtain vector representation for words. Earlier only God or Charles Xavier could have read your mind – but now – AI can too! Try and fathom an alternate reality where all your marketing efforts and expenditures are targeted only where the customer is likely to make a purchase. Your conversion rate will be at an all-time high, and you won’t waste your capital on customers who won’t buy. 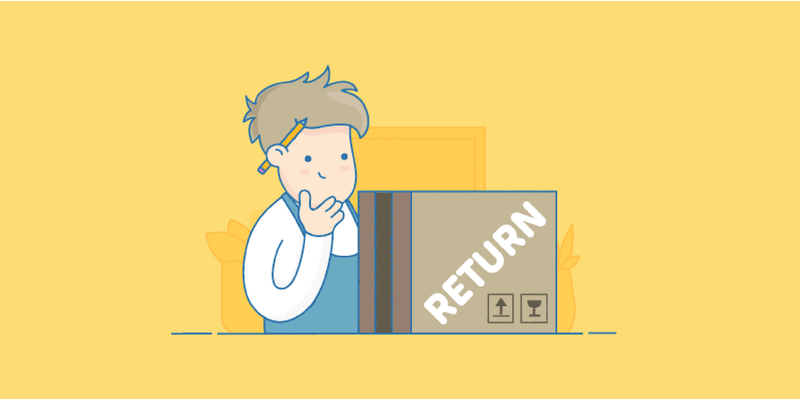 Being able to foretell how much of a given product will sell by a specific date will enable shop owners to stack up on inventory more efficiently, and simultaneously eliminate large sums of undesired cost. It is especially valuable for industries dealing with perishable products, which include not only groceries but also tickets of concert and transportation – anything that costs money when unsold. It might be so hard for you to feel special amongst an ocean of 7 Billion, right? 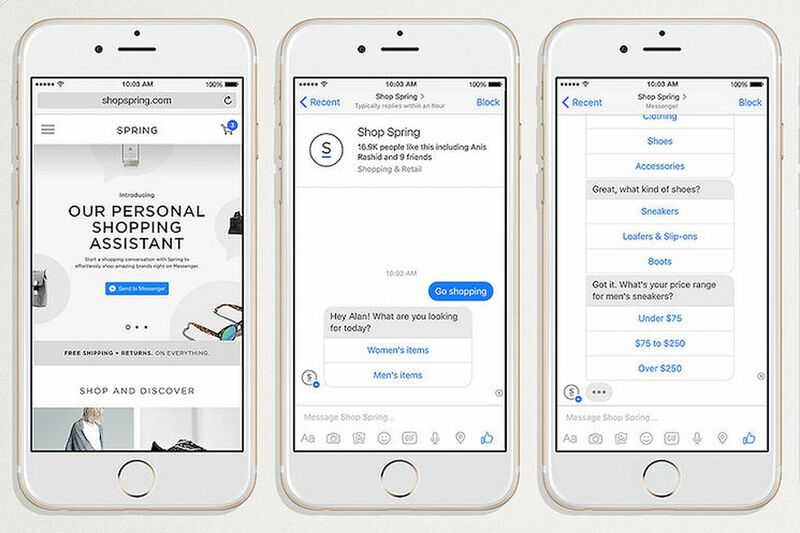 Well, eCommerce websites are adopting chatbots to make you feel special. Companies are increasingly deploying chatbots to improve customer service & satisfaction. Go ahead and browse any ecommerce site, a little chatbox will pop-up asking you what you want to make a purchase of. Once you enter your requirements, you get filtered results specific to your taste. Chatbots have increased customer conversion tremendously by reducing the labor for lazy buyers. We have come so far from the time when chatbots offered just customary replies. Now they have become intelligent beings who understand and tackle a range of issues which they were earlier incapable of. 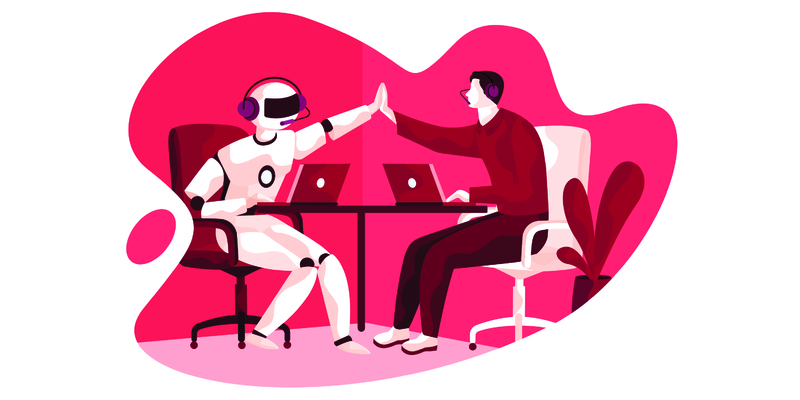 It is vital to provide real-time support to online shoppers as a recent study found that almost 83% of online shoppers need assistance while shopping and chatbots make it possible to provide real-time support. Chatbots also provide a more personalized experience for consumers. Compared with social media, chatbots can make conversations more interactive and engaging. They increase the sales figures by up to 40%. Deploying chatbots helps to collect feedback more efficiently. Additionally, it can make it easier to track purchasing patterns and consumer behavior. Chatbots can provide efficiency, that too at an affordable price. Live support can be quite costly with limited work hours. Chatbots automate the process and can operate 24/7. Chatbots are gaining ground. Apart from potentially changing the industry, implementing a chatbot can be a good marketing campaign. Any company who wants to stay ahead in the race needs to follow this trend. Coming up with innovations isn’t rocket science anymore. AI has become the single biggest driver of massive technological advancements in every tangible domain – and will continue to do so for the foreseeable future. The question we need to ask ourselves is – Are we ready to keep pace and adapt with this onslaught of changes that are happening so rapidly? If No, there you have it. You need to adapt and change pace as quickly as possible. Coz if you don’t, you will be replaced. EngineerBabu excels in providing some of the best eCommerce solutions out there. Our AI-enabled offerings help derive deeper insights into the customer journey and in turn assist businesses in taking calculated decisions on how to advance. Our eCommerce customers have garnered numerous accolades over time. Our dear Australian customer Frankgreen grabbed the Best Design Award for not one, two, but three consecutive years. Ondoor, a grocery retailer earned 100,000 downloads in record time as well! Call us for a free consultation, we’ll be glad to help you out! Also check out our portfolio, right here. eCommerce has been flourishing for a decade now. The yearly growth this domain has witnessed is staggering to even put in words. However, commerce over the internet involves its ambiguities. Since its nascent stage, the ecommerce domain has been marred with security contingencies. eCommerce security involves a set of protocols that safely guide eCommerce transactions. Regardless of scale, all types of eCommerce websites are victims of security contingencies. What makes eCommerce such an appealing target for cybercriminals is the volume and sensitivity of the data they deal with. Millions of customers share their banking information, personal details, and other critical data when they register to use. Even giants like Target and eBay have fallen prey to these attacks. 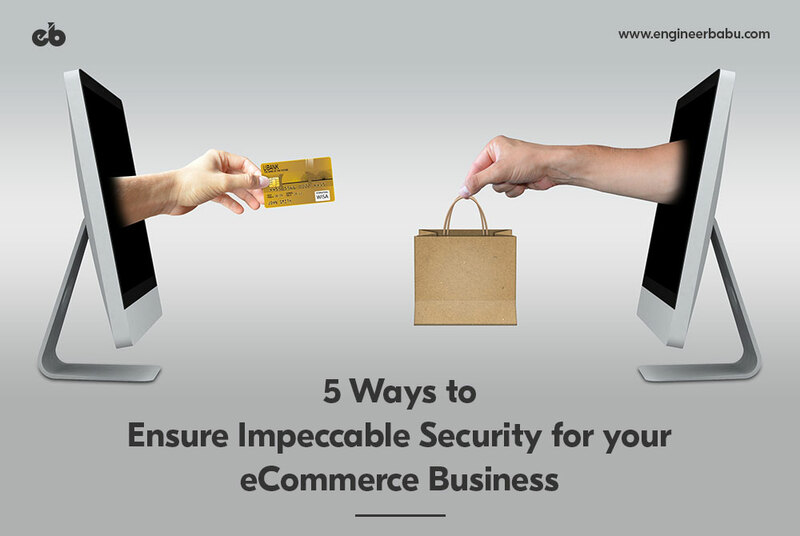 So, what should you do differently to ensure impeccable security for your ecommerce website or business when even tech biggies are struggling with it? In this article, we’ll discuss in length – 5 Security Measures for Your eCommerce Website/Business. There is a wide range of ecommerce security threats out there that hamper trade over the internet. The primary motive behind all these security threats is to exploit the victim in terms of money. These include credit card frauds, malware, phishing attacks, hacking, spams, etc. We can’t even quantify how many product catalogs, user IDs, personal information, and financial information like credit card details a typical eCommerce site stores. That’s what makes eCommerce sites of almost any magnitude, so attractive and appealing to hackers and fraudsters to exploit. A customers’ personal data could be compromised and used for spamming, identity theft and unsolicited marketing. Therefore, privacy issues are one of the most pressing problems for e-commerce businesses. No matter how good your online security measures are, sometimes it is tough to avoid payment frauds. Notorious elements could get access to details of your credit cards by impersonating as financial institutions. Others could copy your product descriptions, product images, copyright logos, even music, and even videos and use it for their purposes. Intellectual property violations are pretty eminent as they could easily be made. Recommended Read: How to Start an eCommerce Business? Ideally, every site needs to have SSL by default. Generally, SSL certificates are used to protect data transfer, credit card transactions, and login information. In a recent development, SSL certifications are also being deployed on social media sites to enable secure browsing. SSL Certificates are records of data which digitally bind a cryptographic key to an organization’s details. 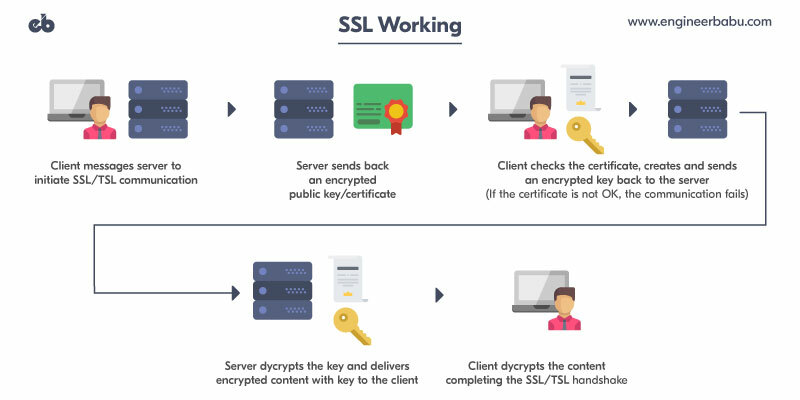 When deployed on a server, SSL activates the padlock and HTTPS protocol and activates secure connections from a web server to a browser. An organizational identity (i.e., company name) and location. The primary reason why the utilization of SSL is increasing is that they keep sensitive information sent across the Internet encrypted so that only the intended recipient can access it. This is critical because the information one sends over the Internet is conceded from computer to the other to get to its destination. If any computer in the network is compromised, the server would be able to see your username, passwords and even sensitive information like credit card numbers if it is not encrypted with an SSL certificate. When an SSL certificate is used, the information becomes unreadable to everyone except for the server you are transferring the information to. This approach safeguards it from potential threats and notorious elements. A user attempts to connect to a website (i.e., a web server) via a web browser. This connection needs to be secured with SSL. The web browser requests the identity of the web server. The web server sends a copy of its SSL certificate. The browser verifies the received SSL certificate. If verified it sends a message to the web server. The web server acknowledges by sending over an acknowledgment. In a study, it was found that nearly 90% of security breaches impact small businesses. PCI Compliance stands for Payment Card Industry Data Security Standard (PCI DSS). The PCI DSS is a security standard for organizations that handle branded credit cards from the major card schemes. The standard came into practice in 2006 and has gained wide popularity worldwide to prevent credit card frauds and to increase controls around cardholder data. PCI compliance applies to corporations of any size that accepts card payment. So, is your ecommerce PCI compliant? There are plenty of reasons to become PCI compliant as this could increasingly secure your online transactions considerably. Small businesses often feel plagued in their capabilities to adjust their processes accordingly to become PCI compliant. Hence, if you want your business to become PCI compliant you need to remember, PCI compliance is attained through a collaborative effort amongst teams, including working with payment processors that ensure PCI compliance, accepting EMV chip cards and even securing your business’s IT infrastructure, networks, and payment processes. PCI compliance can be intimidating and complicated for e-commerce business owners to decipher and implement, but they’re a set of precautions designed to minimize your risk and protect your customers. Use a firewall for payment card data and public network, and keep the firewall updated. Do not store the cardholder’s data. If your business needs to store cardholders’ data, make sure you use strong encryption. Several platforms provide extensions to shift the storage of cardholder data. For instance, you can deploy Magento’s extension BrainTree to switch the storage of the cardholder data. Use encryption to safeguard all transmissions of cardholder data over any public network. You need to ensure that your card processing systems have a vendor-supplied security patch installed. Limit access to cardholder data to as few people as possible. Regularly test your security systems and network environment. Establish an effective and efficient security policy and make sure that all personnel are aware of it. It is an extremely critical business process to employ an efficient ecommerce platform for your business. It is vital, especially for small business, to be extremely vigilant while selecting the correct ecommerce platform for your business. With sleuths of ecommerce platforms being available at throwaway prices, selecting the appropriate platform becomes a daunting task, considering that switching isn’t an appropriate option. Hence, a tonne of planning must go into ensuring that you have selected the best platform. We recommend you to employ a platform which is based on Object-Oriented Programming and includes built-in security protocols. In case, if you opt for WordPress as your platform, select a good WordPress security plugin that will help add an extra layer of protection to your website. Also, set up a bot mitigation solution as it isn’t provided by default. Have a look at the table below, and you’ll get a brief idea on which platform could be leveraged for your business. 4. Do I really need security auditing? YOU DO NEED SECURITY AUDITING. Frequent security checkups and audits are highly recommended for sustaining and reinforcing your ecommerce website’s safety. Audits not just help in weeding out potential threats that may have found their way onto your portal, but also eliminates data of past transactions. Just like casinos; online portals which have round-the-clock cash flow are marred with new security contingencies every other day. Security audits thus become quite necessary to ensure their client’s information is safeguarded efficiently and effectively. An ecommerce business is granted a certificate and a mark after its security audit. Even consumers can differentiate these security audited websites through the individual marks they embody. 5. Is your Customer even Human? Do you know that bots represent 50% of all the website traffic? Do you also know that 30% of this 50% are bad bots? These bad boys are the single-handedly the most significant contributors to eCommerce website frauds. Everyone wants more traffic for their ecommerce site. However, it is necessary to ensure that all this traffic is legitimate and comes from a verified buyer. What you might suppose as legitimate traffic on your website could actually be malicious bots deployed by hackers and even your competitors to scrape your product prices and even steal your entire customer data, vendor data and product catalogs, that too within a matter of a few seconds. STEP 1: Detecting and Analyzing legitimate bot traffic is the first step. Bot detection platforms should be able to make out human traffic from non-human traffic. Non-human traffic patterns could be detected by employing logical puzzles and security questions on pages that involve cash flow. STEP 2: Once you are finished implementing STEP 1, and bot traffic have been identified, the next step involves classifying the type of traffic. Bot traffic could either be from a known source – like that of search engine bots which should be allowed to pass through, and the other could be from a source malicious source, whose intent may not be clear – this shouldn’t be allowed to pass through. If the bot is eyeing for vulnerabilities or trying to commit frauds like shopping cart stuffing, the software should deny access and return a false 404 “page not found” to the bot. For a DoS attack (denial of service), your bot mitigation and management solution should simply divert the traffic. InfiSecure offers real-time and user behavior based bot detection technology to identify bad bots. 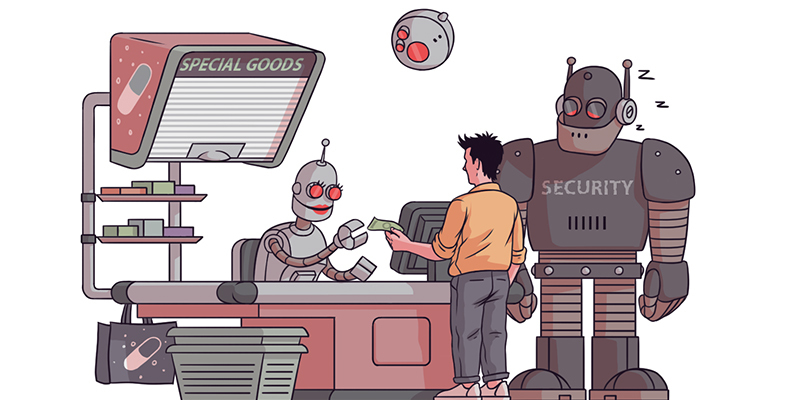 Their tools block web scraping bots in real time before they access your ecommerce website, thus preventing customers from fraudulent orders, data theft, price scraping, and variation tracking. ShieldSquare utilizes a non-intrusive API-based approach to analyses and detects malicious activity on your ecommerce site, thus blocking bots in real-time without impacting the real users already browsing through your product catalog. 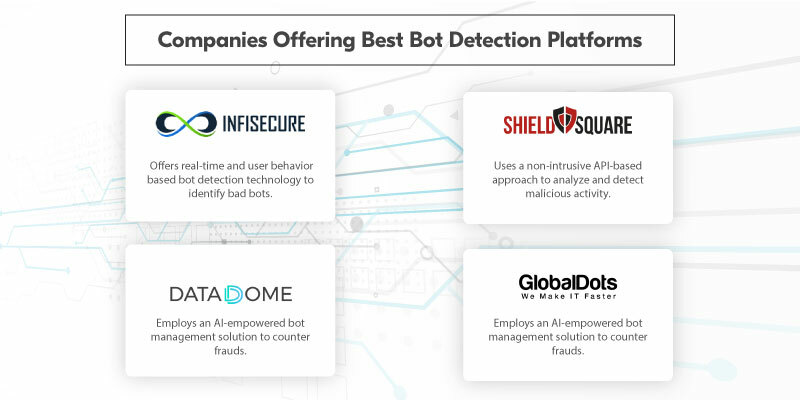 Being employed by some of the significant fortune 500 companies, Data Dome employs an AI-empowered bot management solution to counter frauds like user data theft, price scraping, etc. Global Dots is an extraordinarily efficient and effective platform to ensure security from bad bots. They use Behavioral Fingerprinting to analyze dynamic profiles of real customers to identify click frauds, content and price scraping. Many pillars go into holding-up the dome of eCommerce security. Data privacy being a major concern for every internet-based enterprise right now, it is extremely important, now more than ever to safeguard customer’s data to maintain the dwindling trust with eCommerce-based companies. With the revelation of Cambridge Analytica Scandal consumers have become unsure of commerce over the internet. Whether you are just starting out, or have a small business in a place or a major enterprise – Doesn’t matter. These measures need to function like clockwork to ensure impeccable security for your website. One would also need to keep yourself and your team updated with the latest advancements in Cybersecurity. Stringent security measures must be put in place to protect your company from threats, or risk jeopardizing revenue and customer trust. The fruits of your labor will bear the fruits of your success. How to Enhance Your Payments Usability – Instantly! But there are plenty of reasons why you should be. Business analysis has emerged as a core business practice since the dawn of the 21st century. 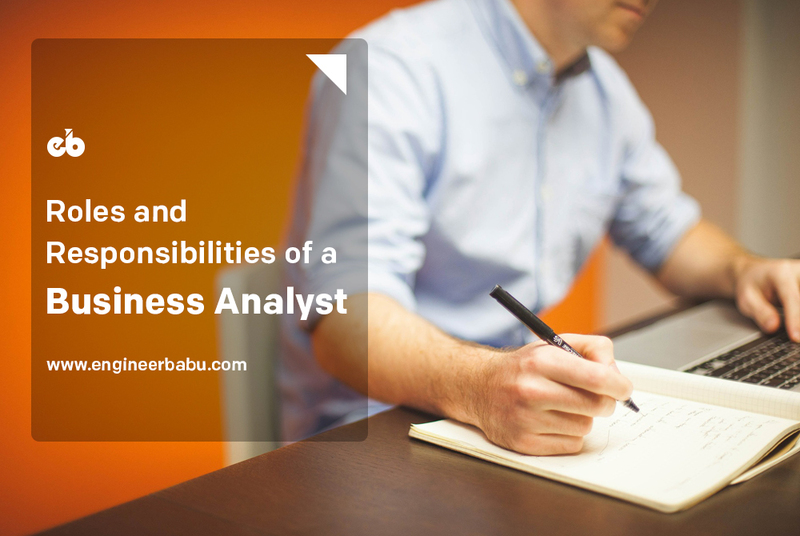 Although every business domain has some business analyst jobs; IT especially has witnessed an explosion of career opportunities for business analyst profiles. So, why has BA swiftly rose to prominence, and why are they being offered such lucrative salary packages? This is primarily because they serve as a vital link between a firm’s information technology capabilities and their business objectives. Skilled business analysts directly contribute to the profitability of companies, large or small. Now, before delving into the roles and responsibilities, and what it takes to become a Business Analyst, let’s dig a little deeper into what precisely does a Business Analyst do. In today’s complex business environment, an organization’s adaptability, agility, and ability to manage constant disruption through innovation can be an important element to ensure success. Traditional approaches may no longer suffice in reaching objectives when economic conditions are unfavorable. That’s where business analysis comes in. Businesses achieve goals through projects that translate customer needs into new products, services, and profits. Business analysts can make that happen rather efficiently & effectively. 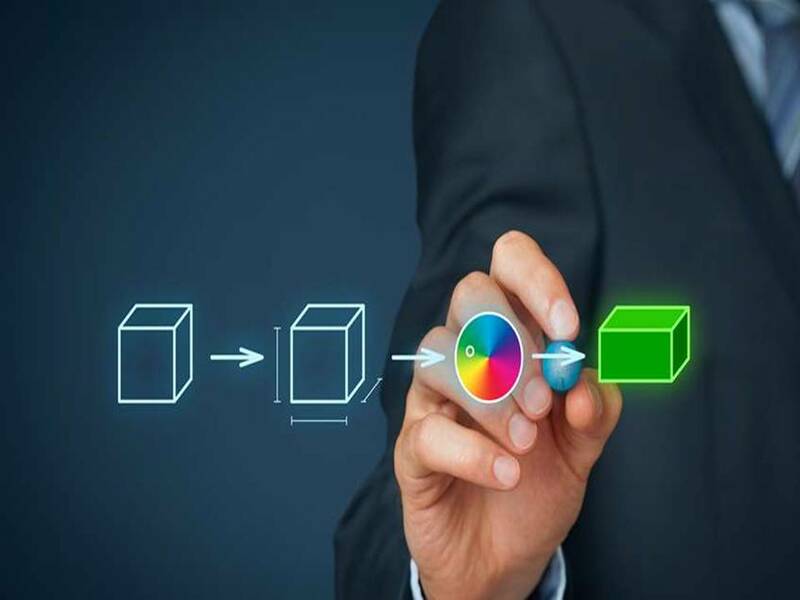 A business analyst’s primary objective is helping businesses cost-effectively implement technology solutions by precisely determining the requirements of a project or a program, and communicating them clearly to the key stakeholders. 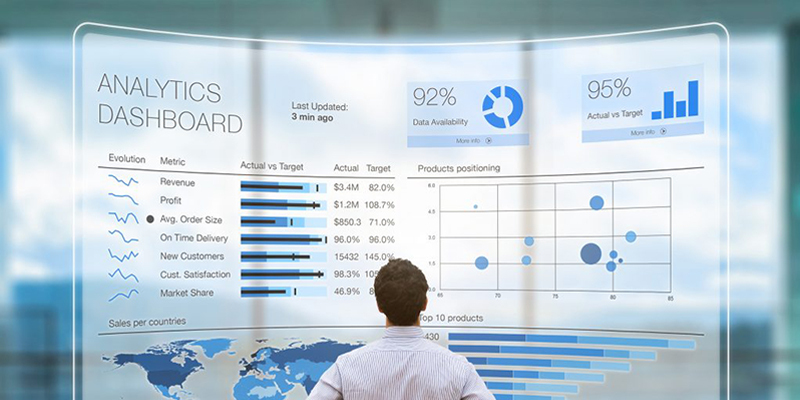 Business analysts usually collect and interpret data from many areas within an organization, simultaneously improving the business processes and finding solutions to business problems with all that gathered data. BAs typically require knowledge of statistics, and statistical softwares such as R. Companies prefer a BA who also possesses relevant SQL skills. The education and training requirements, although, may vary for business by – employer, specific role, and industry. It is possible to enter into the field with just a two-year degree and relevant work experience, but most employers would require at least a bachelor’s degree. 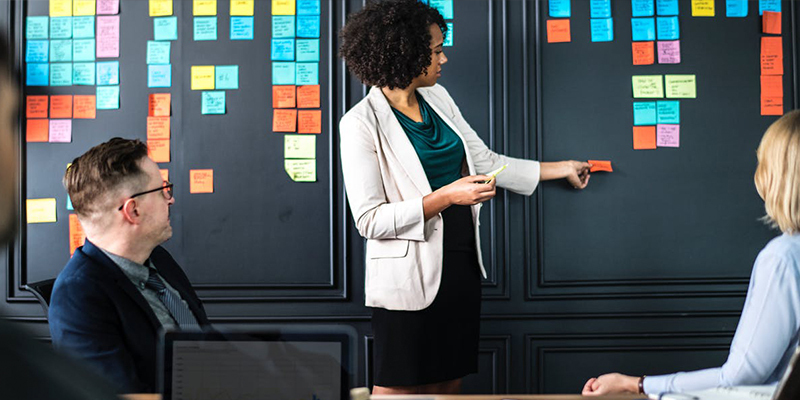 Business analysts should be able to create solutions to problems for the business as a whole, and accordingly must effectively be able to communicate with a variety of business areas. Thus communication skills are another major prerequisite. BAs should be able to understand the business needs of customers and should be able to translate them into the application and operational requirements with the help of solid analytical and product management skills. NOTE: As mentioned, SQL knowledge is a much sought-after skill for business analysts. SQL is a key language utilized for managing data held in RDBMS or relational database systems. Business analysts might not require the same level of SQL knowledge as, say, an analyst would, but a basic understanding of its concept, capabilities and basic functions is essential. Documenting and translating customer business functions and processes. Warranting the system design is perfect as per the needs of the customer. Helping technically in training and coaching professional and technical staff. Developing a training programme and conducting formal training sessions covering designated systems module. Acting as a team-lead on assigned projects and assignments; and providing work direction to the developers and other project stakeholders. Let’s take a look at the responsibilities based on different project phase. Understanding the intricacies of a project is very crucial for BAs. A fundamental responsibility of a Business Analyst is to work in accordance with relevant project stakeholders to understand their requirements and translate them into details, which the developers can comprehend. The key skill set required for this part of the process is the capability of the Analysts to filter the different messages as well as the requirements of the project stakeholders or consumers into a consistent, but, – single vision. Thus, a business analyst devotes a large chunk of time, asking questions. They may even need to conduct interviews, read, observe and align the developers with their target goal. They also need to carry out analysis and look for solutions for both, the organization, as well as the customer. The analysis phase is the stage during which a BA reviews the elements in detail, asserting clearly and unambiguously as what the business needs to do in order achieve its objective. During this stage, the BA will also require to interact with the development team and the technical architects, to design the layout and define accurately what the solution should look like. A Business Analyst then plots the scope and initial requirement of the project. The fundamental goal for any BA is to obtain the project concentrated early by converting the initial high-level goal into a tangible realistic one. For Businesses, it is of paramount importance to create, as well as deliver quality presentations on topics like business requirements, application designs, as well as project status. Good Business Analysts needs to dedicate countless hours actively communicating back and forth. More than just speaking, they need to listen and recognize verbal and non-verbal information. Generally, people watching the presentation of Business Analysts are senior executives of the organization, as well as key management people of IT. Building an open conversation, validating that you understand what you have heard, and communicating what you have gathered to the stakeholders is extremely important to keep the vehicle operating efficiently. Therefore, Business Analysts are expected to impress the stakeholders and other authority with their presentations, which in turn would have a notable effect on the growth of the business. This is where a BA gets into evaluating the needs and ensuring that the implementation team has gathered comprehensive details they require for creating and implementing the process. This phase involves collaborating with a wide range of stakeholders and consumers across the company to guarantee their needs, as well as knowledge, are combined into a detailed document about what they will actually build. An effective document is the one which clearly states options for solving particular difficulties and then helps select the best one. 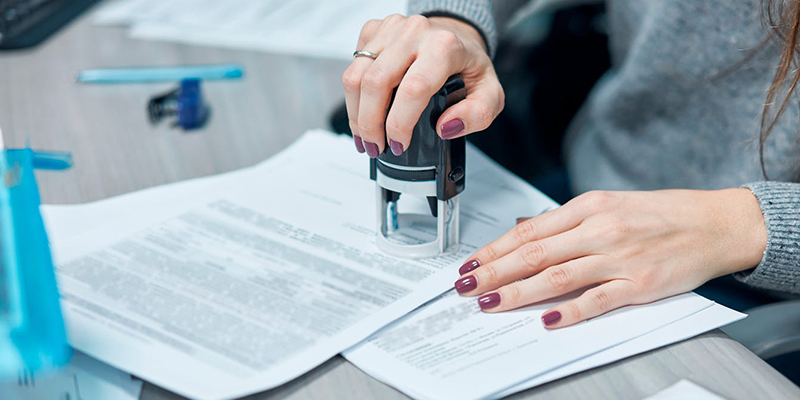 There are oftentimes situations where a BA might miss out on a few requirements from the document. Consequently, the developers won’t be aware of the same which in turn would lead to a considerable loss of time and efforts, as they would be required to redesign the product, this time including the missed part. Hence, it is extremely critical for any BA to effectively document the findings where each requirement of the client is efficiently mentioned, and nothing is left amiss. The favored solution is then estimated throughout the layout and planning – to assure that it meets the business requirements. Ensuring that the systems’ design is up to the mark, as per the needs of the customer is the next decisive step. Business Analyst spends time identifying options for solving particular difficulties and then help pick the best one. The preferred solution is then assessed throughout the layout and planning to assure that it meets the business requirements. The implementation phase, although, is not the final stage for Business Analysts. In fact, it could turn out to be the riskiest time for things to go awry and for objectives to be overlooked. It is during this step that a BA should be aware of how clients are utilizing the framework. Do they clearly see the benefits envisaged in the business case? In essence, Business Analysts are the navigators, responsible for reaching the end destination, which implies a satisfying resolution of a business problem. The BA must always be aware of what the end-game is, how to get there and should be competent enough of handling course adjustments as they occur. Witnessing how quickly economic conditions and business needs are changing. You need to prepare yourselves and create a proper plan to stay relevant in this rat race. Finding success as a business analyst requires proper planning and commitment to your career. Without planning for your future, you will end up feeling lost on your way. No one can accurately predict how the job market will look like – a few years, or even months for that matter. So it would be in your best interest to prepare yourself by enrolling in business analyst training programs, to acquire the in-demand skills that can help you break into this exciting and prosperous domain. EngineerBabu boasts a talented bunch of business analysts working to ensure that our customers receive the best quality deliverables. So, if you are looking to expand your horizons and explore this lucrative domain, consider forwarding us your resume. We would love to chat with you. In case you are looking for a tech partner to make your product dreams a reality, call us for a free consultation. We have a host of award-winning products in our portfolio. Also, tell us how you felt about this article in the comments below.